The Indian Armed Forces are the military forces of the Republic of India. It consists of three professional uniformed services: the Indian Army, Indian Navy, and Indian Air Force. Additionally, the Indian Armed Forces are supported by the Indian Coast Guard and paramilitary organisations (Assam Rifles, and Special Frontier Force) and various inter-service commands and institutions such as the Strategic Forces Command, the Andaman and Nicobar Command and the Integrated Defence Staff. The President of India is the Supreme Commander of the Indian Armed Forces. The Indian Armed Forces are under the management of the Ministry of Defence (MoD) of the Government of India. With strength of over 1.4 million active personnel, it is the world's 2nd largest military force and has the world's largest volunteer army. It is important to note that the Central Armed Police Forces, which are commonly and incorrectly referred to as 'Paramilitary Forces' based on colonial perspective, are not armed forces. As such they are headed by civilian officers from the Indian Police Service and are under the control of the Ministry of Home Affairs, not the Ministry of Defence. These are central police organisations. The Indian armed forces have been engaged in a number of major military operations, including: the Indo-Pakistani wars of 1947, 1965 and 1971, the Portuguese-Indian War, the Sino-Indian War, the 1967 Chola incident, the 1987 Sino-Indian skirmish, the Kargil War, and the Siachen conflict among others. India honours its armed forces and military personnel annually on Armed Forces Flag Day, 7 December. Since 1962, the IAF has maintained close military relations with Russia, including cooperative development of programmes such as the Fifth Generation Fighter Aircraft (FGFA) and the Multirole Transport Aircraft (MTA). Armed with the nuclear triad, the Indian armed forces are steadily undergoing modernisation, with investments in areas such as futuristic soldier systems and missile defence systems. The Department of Defence Production of the Ministry of Defence is responsible for the indigenous production of equipment used by the Indian Armed Forces. It comprises the 41 Indian Ordnance Factories under the control of the Ordnance Factories Board, and eight Defence PSUs namely: HAL, BEL, BEML, BDL, MDL, GSL, GRSE and Midhani. India was the largest importer of defence equipment in 2014 with Russia, Israel, France and the United States being the top foreign suppliers of military equipment. The Government of India has launched a Make in India initiative to indigenise manufacturing and reduce dependence on imports, including defence imports and procurement. India has one of the longest military histories, dating back several millennia. The first reference to armies is found in the Vedas as well as the epics Ramayana and Mahabaratha. Classical Indian texts on archery in particular, and martial arts in general are known as Dhanurveda. Indian maritime history dates back 5,000 years. The first tidal dock is believed to have been built at Lothal around 2300 BC during the Indus Valley Civilisation period, near the present day port of Mangrol on the Gujarat coast. The Rig Veda written around 1500 BC, credits Varuna with knowledge of the ocean routes and describes naval expeditions. There is reference to the side wings of a vessel called Plava, which gives the ship stability in storm conditions. A compass, Matsya yantra was used for navigation in the fourth and fifth century AD. The earliest known reference to an organisation devoted to ships in ancient India is in the Mauryan Empire from the 4th century BC. Powerful militaries included those of the: Maurya, Satavahana, Chola, Vijayanagara, Mughal and Maratha empires. Emperor Chandragupta Maurya's mentor and advisor Chanakya's Arthashastra devotes a full chapter on the state department of waterways under navadhyaksha (Sanskrit for Superintendent of ships) . The term, nava dvipantaragamanam (Sanskrit for "sailing to other lands by ships," i.e. exploration) appears in this book in addition to appearing in the Vedic text, Baudhayana Dharmashastra as the interpretation of the term, Samudrasamyanam. Sea lanes between India and neighbouring lands were used for trade for many centuries, and are responsible for the widespread influence of Indian Culture on other societies. The Cholas excelled in foreign trade and maritime activity, extending their influence overseas to China and Southeast Asia. During the 17th and 18th centuries, the Maratha and Kerala fleets were expanded, and became the most powerful Naval Forces in the subcontinent, defeating European navies at various times (See the Battle of Colachel). The fleet review of the Maratha navy, at which the ships Pal and Qalbat participated, took place at the Ratnagiri fort. The Maratha Kanhoji Angre, and Kunjali Marakkar, the Naval chief of Saamoothiri were two notable naval chiefs of the period. The Royal Indian Navy was first established by the British while much of India was under the control of the East India Company. In 1892, it became a maritime component as the Royal Indian Marine (RIM). During World War I the Indian Army contributed a number of divisions and independent brigades to the European, Mediterranean and Middle Eastern theatres of war. One million Indian troops served overseas; 62,000 died and another 67,000 were wounded. In total, 74,187 Indian soldiers died during the war. It fought against the German Empire in German East Africa and on the Western Front. Indian divisions were also sent to Egypt, Gallipoli and nearly 700,000 served in Mesopotamia against the Ottoman Empire. Following WWI, the Indian Armed Forces underwent significant transformation. In 1928, Engineer Sub-lieutenant D. N. Mukherji became the first Indian to receive a commission in the Royal Indian Marine. In 1932, the Indian Air Force was established as an auxiliary air force; two years later, the RIM was upgraded to the status of a naval service as the Royal Indian Navy (RIN). Though the gradual "Indianisation" of the officer corps began after WWI, at the outbreak of war in 1939, there were no Indian flag, general or air officers in the armed services. The highest-ranking Indian officers were those serving in the non-combatant Indian Medical Service, who held no rank higher than colonel; in the regular Indian Army, there were no Indian officers above the rank of major. The Royal Indian Navy had no Indian senior line officers and only a single Indian senior engineer officer, while the Indian Air Force had no Indian senior officers in 1939, with the highest-ranking Indian air force officer a flight lieutenant. In World War II, the Indian Army began the war in 1939 with just under 200,000 men. By the end of the war it had become the largest volunteer army in history, rising to over 2.5 million men by August 1945. Serving in divisions of infantry, armour and a fledgling airborne forces, they fought on three continents in Africa, Europe and Asia. The Indian Army fought in Ethiopia against the Italian Army, in Egypt, Libya and Tunisia against both the Italian and German Army, and, after the Italian surrender, against the German Army in Italy. However, the bulk of the Indian Army was committed to fighting the Japanese Army, first during the British defeats in Malaya and the retreat from Burma to the Indian border; later, after resting and refitting for the victorious advance back into Burma, as part of the largest British Empire army ever formed. These campaigns cost the lives of over 36,000 Indian servicemen, while another 34,354 were wounded; 67,340 became prisoners of war. Their valour was recognised with the award of some 4,000 decorations, and 38 members of the Indian Army were awarded the Victoria Cross or the George Cross. The demands of war and increasing recognition that the era of British dominance in the subcontinent was ending increased the pace of "Indianisation." In 1940, Subroto Mukherjee (later the first Indian C-in-C and Chief of the Air Staff) became the first Indian to command an air force squadron and attain the (albeit acting) rank of squadron leader. In July 1941, Indian Medical Service officer Hiraji Cursetji became one of the first Indian officers to be promoted to substantive general officer rank. During the war, several Indian Army officers, notably Kodandera M. Cariappa, S. M. Shrinagesh and Kodandera Subayya Thimayya, all of whom would subsequently command the Indian Army, achieved distinction as the first Indian battalion and brigade commanders. At the end of hostilities in 1945, the Indian Army's officer corps included Indian Medical Service officer Hiraji Cursetji as its sole Indian major-general, one IMS brigadier, three Indian brigadiers in combatant arms and 220 other Indian officers in the temporary or acting ranks of colonel and lieutenant-colonel. From October 1945, the granting of regular commissions in the Indian Armed Forces was restricted to Indians, though provisions were made for the continued secondment of British officers for as long as was deemed necessary. In 1946, sailors of the Royal Indian Navy mutinied on board ships and in shore establishments. A total of 78 ships, 20 shore establishments and 20,000 sailors were involved in the rebellion, which had an impact across India. Indianization of the armed forces nevertheless continued to progress, though by June 1947, two months before Independence, the Indian Army had only 14 Indian officers at the rank of brigadier serving in combatant arms, with no Indian flag, general or air officers in the combat arms of the armed services. The period immediately following Indian independence was a traumatic time for India and her armed services. Along with the newly independent India, the Indian Armed Forces were forcibly divided between India and Pakistan, with ships, divisions and aircraft allocated to the respective Dominions. Upon Independence on 15 August 1947, K. M. Cariappa and K.S. Rajendrasinhji were promoted to the rank of major-general from brigadier; 12 other Indian officers then held the rank of brigadier. By the end of 1947, there were a total of 13 Indian major-generals and 30 Indian brigadiers, with all three army commands being led by Indian officers by October 1948, at which time only 260 British officers remained in the new Indian Army as advisers or in posts requiring certain technical abilities. During this period, the armed forces of India were involved in a number of significant military operations, notably the Indo-Pakistani War of 1947 and Operation Polo, the code name of a military operation in September 1948 where the Indian Armed Forces invaded the State of Hyderabad and overthrew its Nizam, annexing the state into the Indian Union. On 15 January 1949, General K M Cariappa was appointed the first Indian Commander-in-Chief of the Indian army. Upon India becoming a sovereign republic on 26 January 1950, some of the last vestiges of British rule - rank badges, imperial crowns, British ensigns and "Royal" monikers - were dropped and replaced with the Indian tricolour and the Lion Capital of Asoka. While India had become a republic, British officers seconded from the British Armed Forces continued to hold senior positions in the Indian Armed Forces into the early 1960s. On 1 April 1954, Air Marshal Subroto Mukherjee became the first Indian Commander-in-Chief of the Indian Air Force. Effective from 1 April 1955, a Parliamentary Act, the Commanders-In-Chiefs (Change in Designation) Act, re-designated the office of Commander-in-Chief as the Chief of Staff of each branch. Not until 1958 would the last British chief of staff that of the Indian Navy, be succeeded by an Indian. On 22 April of that year, Vice Admiral Ram Dass Katari became the first Indian Chief of Naval Staff. 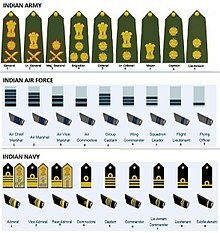 The Chiefs of Staff of the Indian Air Force and the Indian Navy were upgraded to four-star rank on par with the Chief of Army Staff in 1966 and 1968, respectively. In 1961 tensions rose between India and Portugal over the Portuguese-occupied territory of Goa, which India claimed for itself. After Portuguese police cracked down violently on a peaceful, unarmed demonstration for union with India, the Indian government decided to invade and initiated Operation Vijay. A lopsided air, sea, and ground campaign resulted in the speedy surrender of Portuguese forces. Within 36 hours, 451 years of Portuguese colonial rule ended, and Goa was annexed by India. India fought four major wars with its neighbour Pakistan in 1947, 1965, 1971 and 1999, and with China in 1962. Indian victory over Pakistan in the 1971 war, helped create the free country of Bangladesh. In the late 1970s and early 1980s, Pakistan began organising tourist expeditions to the Siachen Glacier, disputed territory with India. Irked by this development, in April 1984 India initiated the successful Operation Meghdoot during which it gained control over all of the 70 kilometer (41 mile)-long Siachen Glacier, and all of its tributary glaciers, as well as the three main passes of the Saltoro Ridge immediately west of the glacier—Sia La, Bilafond La, and Gyong La. According to TIME magazine, India gained more than 1,000 square miles (3,000 km2) of territory as a result of its military operations in Siachen. In 1987 and in 1989 Pakistan to re-take the glacier but was unsuccessful. The conflict ended with Indian Victory. There has been a ceasefire since 2003. The Indian Peace Keeping Force (IPKF) carried out a mission in northern and eastern Sri Lanka in 1987–1990 to disarm the Tamil Tigers under the terms of the Indo-Sri Lanka Accord. It was a difficult battle for the Indian Army, which was not trained for an unconventional war. After losing approximately 1,200 personnel and several T-72 tanks, India ultimately abandoned the mission in consultation with the Sri Lankan government. In what was labelled as Operation Pawan, the Indian Air Force flew about 70,000 sorties to and within Sri Lanka. The beginning of the 21st century saw a reorientation for India on the global stage from a regional role in the subcontinent to a major role in the Indian Ocean region stretching from the Gulf of Aden to the Malacca Strait. India's sphere of influence needs to encompass not just the South Asian Sub-continent, but also the northern Indian Ocean area, from the eastern seaboard of Africa in the west, to the Malacca Straits in the east, and must include Iran, Afghanistan, the Central Asian Republics (CARs), China and Myanmar. India's credibility, as a regional power will be contingent on institutional stability, economic development and military strength, including nuclear deterrence. The long stretches of disputed borders with China and Pakistan, and sizeable areas under their occupation, continue to be major irritants, in spite of the peace processes under-way with both countries. The headquarters of the Indian Armed Forces is in New Delhi, the capital city of India. The President of India serves as the formal Supreme Commander of the Indian Armed Forces, while actual control lies with the executive headed by the Prime Minister of India. The Ministry of Defence (MoD) is the ministry charged with the responsibilities of countering insurgency and ensuring external security of India. General Bipin Rawat is the Chief of the Army Staff (COAS), Admiral Sunil Lanba is the Chief of the Naval Staff (CNS) and Air Chief Marshal Birender Singh Dhanoa is the Chief of the Air Staff (CAS). [needs update] The Indian armed force are split into different groups based on their region of operation. The Indian Army is divided administratively into seven tactical commands, each under the control of different Lieutenant Generals. The Indian Air Force is divided into five operational and two functional commands. Each command is headed by an air officer commanding-in-chief with the rank of air marshal. The Indian Navy operates three commands. Each command is headed by a flag officer commanding-in-chief with the rank of vice admiral. There are two joint commands whose head can belong to any of the three services. These are the Strategic Forces Command and the Andaman and Nicobar Command. The lack of an overall military commander has helped keep the Indian Armed Forces under civilian control, and has prevented the rise of military dictatorships unlike in neighbouring Pakistan. The code of conduct of the Indian military is detailed in a semi-official book called Customs and Etiquette in the Services, written by retired Major General Ravi Arora, which details how Indian personnel are expected to conduct themselves generally. Arora is an executive editor of the Indian Military Review. The major deployments of the Indian army constitute the border regions of India, particularly Jammu and Kashmir, Ladakh, and Northeast India, to engage in counter-insurgency and anti-terrorist operations. The major commitments of the Indian Navy constitute patrol missions, anti-piracy operations off the coast of Somalia, the 'Singapore Indian Maritime Bilateral Exercise' with the Republic of Singapore Navy in the Straits of Malacca, maintaining a military presence in Southeast Asias waters, and joint exercises with other countries, such as: Brasil, South Africa, the United States and Japan, France (Varuna naval exercises), the People's Republic of China, the Russian Navy (INDRA naval exercises), and others. Between April 2015 and March 2016, India allocated $40 billion to Defence Services, $10 billion to Defence (Civil Estimates) and another $10 billion to the Home Ministry for Paramilitary and CAPF forces - a total allocation for defence and security of about $60 billion for the financial year 2015–16. In 2016-17, the contribution to the Home Ministry has been increased from $10 billion to $11.5 billion. Contemporary criticism of the Indian military have drawn attention to several issues, such as lack of political reform, obsolete equipment, lack of adequate ammunition, and inadequate research and development due to over-reliance on foreign imports. In addition, the lack of a 'strategic culture' among the political class in India is claimed to have hindered the effectiveness of the Indian military. Critics believe these issues hobble the progress and modernisation of the military. However, analysis by the Central Intelligence Agency indicates that India is projected to have the fourth most capable concentration of power by 2015. [needs update] According to a report published by the US Congress, India is the developing world's leading arms purchaser. It is investing ₹99.7 billion (US$1.4 billion) to build a dedicated and secure optical fibre cable (OFC) network for exclusive use of the Army, Navy and Air Force. This will be one of the world's largest closed user group (CUG) networks. During 2010, the Indian Armed Forces had a reported strength of 1.4 million active personnel and 2.1 million reserve personnel. In addition, there were approximately 1.3 million paramilitary personnel, making it one of the world's largest military forces. A total of 1,567,390 ex- servicemen are registered with the Indian Army, the majority of them hailing from: Uttar Pradesh (271,928), Punjab (191,702), Haryana (165,702), Maharashtra (143,951), Kerala (127,920), Tamil Nadu (103,156), Rajasthan (100,592) and Himachal Pradesh (78,321). Many of them are re-employed in various Central government sectors. Prior to 1992, women served in auxiliary services. Since then, women have been granted the right to serve as officers in the military and starting 2015, women fighter jet combat pilots were also inducted. As of 2014, the percentage of the women in the army was 3%, in the navy was 2.8% and in the air force was 8.5%. The Indian Armed Forces have set up numerous military academies across India for training personnel. Military schools, Sainik Schools, and the Rashtriya Indian Military College were founded to broaden the recruitment base of the Defence Forces. The three branches of the Indian Armed Forces jointly operate several institutions such as: the National Defence Academy (NDA), the Defence Services Staff College (DSSC), the National Defence College (NDC) and the College of Defence Management (CDM) for training its officers. The Armed Forces Medical College (AFMC) at Pune is responsible for providing the entire pool of medical staff to the Armed Forces by giving them in-service training. Officer recruitment is through many military-related academies. Besides the tri-service National Defence Academy, Pune, the three services have their own training institutes for this purpose. These include: the Indian Military Academy, Dehradun, Indian Naval Academy, Ezhimala, Air Force Academy, Hyderabad, Officers Training Academy at Chennai and Gaya. Other notable institutions are the Army War College, at Mhow, Madhya Pradesh, the High Altitude Warfare School (HAWS), at Gulmarg, Jammu and Kashmir, the Counter Insurgency and Jungle Warfare School (CIJW), in Vairengte, Mizoram, and the College of Military Engineering (CME), in Pune. After being commissioned, officers are posted and deputed, and are at the helm of affairs not only inside India but also abroad. Officers are appointed and removed only by the President of India. Farkhor Air Base is a military air base located near the town of Farkhor in Tajikistan, 130 kilometres (81 mi) southeast of the capital Dushanbe. It is operated by the Indian Air Force in collaboration with the Tajikistan Air Force. Farkhor is India's first and only military base outside its territory. There was an unconfirmed report of India building some assets at Ayni air base in Tajikistan although the Tajik government has denied this. However, India had deployed its Army and Border Roads Organisation personnel to upgrade Ayni airbase by extending its runway, constructing an air-traffic control tower and perimeter fencing around the base. India provided medium-lift choppers to Tajikistan and a dedicated hospital there as part of efforts to build on the strategic ties between the two countries against the backdrop of US-led troops pulling out from Afghanistan in 2014. India is also helping with the development of Chah Bahar Seaport in southeastern Iran, which is speculated to be done to secure India's Maritime assets and also as a gateway to Afghanistan & Central Asia. However, India and Israel also have a very strong defence relationship. In the 1950 Indo-Nepal Treaty of Peace and Friendship, India took on the obligation to actively assist Nepal in national defence and military preparedness, and both nations agreed not to tolerate threats to each other's security. In 1958, the then-Indian Prime Minister Jawaharlal Nehru visited Bhutan and reiterated India's support for Bhutan's independence and later declared in the Indian Parliament that any aggression against Bhutan would be seen as aggression against India. India started the process to bring the island country Maldives into India's security grid. India is also one of three countries with whom Japan has a security pact, the others being Australia and the United States. India and Russia maintain strong military co-operation. India has defence pacts with the US focusing on areas including security, joint training, joint development and manufacture of defence equipment and technology. In 1951, India and Burma signed a Treaty of Friendship in New Delhi. Article II of the treaty stipulates that "There shall be everlasting peace and unalterable friendship between the two States who shall ever strive to strengthen and develop further the cordial relations existing between the peoples of the two countries." India had signed a pact to develop ports in Myanmar and various bilateral issues, including economic co-operation, connectivity, security and energy. India has a "comprehensive strategic partnership" with UAE. India has maritime security arrangements in place with Oman and Qatar. In 2008, a landmark defence pact was signed, under which India committed its military assets to protect "Qatar from external threats". On 9 June 2012, the JIMEX 2012 naval exercise took place off the coast of Tamil Nadu in India to Tokyo in Japan. This was the first ever bilateral maritime exercise between the two nations in a long time, reflecting their similar interests, especially those involving spontaneous regional security against common external aggressors. The Indian Navy has berthing rights in Oman and Vietnam. As part of its two decade-old Look East policy, India has substantially stepped up military engagement with East Asian and ASEAN nations. Although never explicitly stated, ASEAN and East Asian nations want New Delhi to be a counterweight to increasing Chinese footprints in the region. Philippines, Thailand, Indonesia and, particularly, Vietnam and Myanmar have time and again pressed India to help them both in terms of military training and weapons supply. Myanmar's Navy Chief, Vice Admiral Thura Thet Swe during his four-day visit to India in late July 2012 held wide-ranging consultations with top officials from the Indian Ministry of Defence. Apart from increasing the number of training slots of Myanmar officers in Indian military training establishments, India has agreed to build at least four Offshore Patrol Vehicles (OPV) in Indian Shipyards to be used by Myanmar's navy. For more than a decade now, India has assisted Vietnam in beefing up its naval and air capabilities. For instance, India has repaired and upgraded more than 100 MiG 21 planes of the Vietnam People's Air Force and supplied them with enhanced avionics and radar systems. Indian Air Force pilots have also been training their Vietnamese counterparts. In a first, India has offered a $100-million credit line to Vietnam to purchase military equipment. A bilateral agreement for the use of facilities in India by the Singapore Air Force and Army was signed in October 2007 and August 2008 respectively and has been extended up to 2017. Singapore is the only country to which India is offering such facilities. The Indian Army is a voluntary service, the military draft having never been imposed in India. It is one of the largest standing armies (and the largest standing volunteer army) in the world, with 1,129,900 active troops and 960,000 reserve troops. The force is headed by the Chief of Army Staff of the Indian Army, General Bipin Rawat. The highest rank in the Indian Army is Field Marshal, but it is a largely ceremonial rank and appointments are made by the President of India, on the advice of the Union Cabinet of Ministers, only in exceptional circumstances. (See Field Marshal (India)). Late Field Marshal S.H.F.J. Manekshaw and the late Field Marshal Kodandera Madappa Cariappa are the only two officers who have attained this rank. The army has rich combat experience in diverse terrains, due to India's varied geography, and also has a distinguished history of serving in United Nations peacekeeping operations. Initially, the army's main objective was to defend the nation's frontiers. However, over the years, the army has also taken up the responsibility of providing internal security, especially in insurgent-hit Kashmir and the north-east. The Indian Army has seen military action during the First Kashmir War, Operation Polo, the Sino-Indian War, the Second Kashmir War, the Indo-Pakistani War of 1971, the Sri Lankan Civil War and the Kargil War. It has dedicated one brigade of troops to the UN's standby arrangements. Through its large, sustained troop commitments India has been praised for taking part in difficult operations for prolonged periods. The Indian Army has participated in several UN peacekeeping operations including those in: Cyprus, Lebanon, the Democratic Republic of the Congo, Angola, Cambodia, Vietnam, Namibia, El Salvador, Liberia, Mozambique and Somalia. The army also provided a paramedical unit to facilitate the withdrawal of the sick and wounded in the Korean War. The current combat doctrine of the Indian Army is based on effectively utilising holding formations and strike formations. In the case of an attack, the holding formations would contain the enemy, and strike formations would counter-attack to neutralise enemy forces. In the case of an Indian attack, the holding formations would pin enemy forces down whilst the strike formations attack at a point of India's choosing. The Indian Army is large enough to devote several corps to the strike role. The army is also looking at enhancing its special forces capabilities. With the role of India increasing, and the need to protect India's interests on far-off shores becoming important, the Indian Army and Indian Navy are jointly planning to set up a marine brigade. The Army's field force comprises thirteen corps, three armoured divisions, four Reorganised Army Plains Infantry Divisions (RAPID), eighteen infantry divisions and ten mountain divisions, a number of independent brigades, and requisite combat support and service support formations and units. Among the thirteen, three are "strike" corps — Mathura (I Corps), Ambala (II Corps) and Bhopal (XXI Corps). The main combat and combat support units are 62 armoured regiments, and over 350 infantry battalions and 300 artillery regiments (including two surface-to-surface missile (SSM) units). Amongst major armaments and equipment, there are nearly 4000 main battle tanks, 2000 armoured personnel carriers, 4300 artillery pieces and 200 light helicopters. India is raising a new mountain strike corps to strengthen its defence along its disputed border with China in the high reaches of the Himalayas. However, the entire XVII Corps, with its headquarters at Panagarh in West Bengal, will only be fully raised with 90,274 troops at a cost of 646.7 Billion Indian Rupees by 2018–2019 (circa 7.3 Billion USD at 2018 rates). With units spread across the 4,057 kilometres (2,521 mi) Line of Actual Control (LAC) from Ladakh to Arunachal Pradesh, the corps will have two high-altitude infantry divisions (59 Div at Panagarh and 72 Div at Pathankot) with their integral units, two independent infantry brigades, two armoured brigades and the like. It will include 30 new infantry battalions and two Para-Special Forces battalions. In other words, it will have "rapid reaction force" capability to launch a counter-offensive into Tibet Autonomous Region (TAR) in the event of any Chinese attack. The Army Aviation Corps is another vital part of the Indian Army formed on 1 November 1986. The army aviation pilots are drawn from other combat arms, including artillery officers, to form a composite third dimensional force for an integrated battle. IAF operates and flies attack Helicopters like the Mil Mi-25/Mi-35 which are owned and administered by the Indian Air Force, but under the operational control of the Army and play a major role to support the armoured columns and infantry. Apart from the attack role, helicopters like the HAL Chetak, HAL Cheetah, and HAL Dhruv provide logistical support for the Indian Army in remote and inaccessible areas, especially the Siachen Glacier. To equip Army Aviation Corps, procurement process for 197 light utility helicopters (LUH) is ongoing, of which 64 will be inducted in the Army Aviation to replace the Cheetak and Cheetah Helicopters. HAL has obtained a firm order to deliver 114 HAL Light Combat Helicopters to the Indian Army. India is re-organising its mechanised forces to achieve strategic mobility and high-volume firepower for rapid thrusts into enemy territory. At present, the Indian army has severe deficiencies in its artillery (particularly self-propelled guns) and ammunition stocks, not to mention the inability of some of its modern tanks to operate in the heat and dust of the desert regions around the international border. India proposes to progressively induct as many as 248 Arjun MBT and to develop and induct the Arjun MK-II variant, 1,657 Russian-origin T-90S main-battle tanks, apart from the ongoing upgrade of its T-72 fleet. Arjun MK-II trials had already begun in August 2013. The improved features of the MK-II version of Arjun are night vision capabilities with a thermal imaging system for detecting all kinds of missiles, Explosive Reactive Armour (ERA), mine ploughs, the ability to fire anti-tank missiles with its 120 mm main gun, an Advanced Air Defence gun capable of shooting down helicopters with a 360 degree coverage, Automatic Target Tracking (ATT) lending a greater accuracy when it comes to moving targets and superior Laser Warning and Control systems. The Indian Army will upgrade its entire Boyevaya Mashina Pekhoty-2 (BMP-2)/2K infantry combat vehicle (ICV) fleet to enhance their ability to address operational requirements. Upgrades include integration of the latest generation fire control system, twin missile launchers and commander's thermal imaging panoramic sights, anti- tank guided missiles, as well as automatic grenade launchers. Under the Field Artillery Rationalisation Plan, the army plans to procure 3000 to 4000 pieces of artillery at a cost of US$3 billion. This includes purchasing 1580 towed, 814 mounted, 180 self-propelled wheeled, 100 self-propelled tracked and 145 ultra-light 155 mm/52 calibre artillery guns. After three years of searching and negotiations, India ordered M777 155mm howitzers from USA in September 2013. To lend greater firepower support to the mechanised infantry, DRDO has developed the Pinaka multiple rocket launcher. The system has a maximum range of 39–40 kilometres (24–25 mi) and can fire a salvo of 12 HE rockets in 44 seconds, neutralising a target area of 3.9 square kilometres (1.5 sq mi). The system is mounted on a Tatra truck for mobility. Pinaka saw service during the Kargil War, where it was successful in neutralising enemy positions on the mountain tops. It has since been inducted into the Indian Army in large numbers. The Indian Army has also embarked on an infantry modernisation programme known as Futuristic Infantry Soldier As a System (F-INSAS). The infantry soldiers will be equipped with modular weapon systems that will have multiple functions. The core systems include bullet proof helmet and visor. The bullet proof helmet is an integrated assembly equipped with helmet mounted flashlight, thermal sensors and night vision device, miniature computer with audio headsets. The personal clothing of the soldier of the future would be lightweight with a bullet-proof jacket. The futuristic jacket would be waterproof, yet it would be able to breathe. The new attire will enable the troops to carry extra loads and resist the impact of nuclear, chemical and biological warfare. The new uniform will have vests with sensors to monitor the soldier's health parameters and to provide quick medical relief. The weapons sub-system is built around a multi-calibre individual weapon system with the fourth calibre attached to a grenade launcher. These include a 5.56 mm, a 7.62 mm and a new 6.8 mm under development for the first time in India. In November 2013, the Indian Army moved a step closer to the battlefield of the future, where command networks know the precise location of every soldier and weapon, with whom generals can exchange reports, photos, data and verbal and written communications. Army headquarters called in 14 Indian companies and issued them an expression of interest (EoI) for developing a Battlefield Management System (BMS). The BMS will integrate combat units — armoured, artillery and infantry regiments, infantry battalions, helicopter flights, etc. — into a digital network that will link together all components of the future battlefield. While precise costs are still unclear, vendors competing for the contract say the army expects to pay about Rs 40,000 crore for developing and manufacturing the BMS. However, in 2015, the Indian Army decided to replace the F-INSAS program in favour of two separate projects. The new program will have two components: one arming the modern infantry soldier with the best available assault rifle, carbines and personal equipment such as the helmet and bulletproof vests, the second part is the Battlefield Management Systems (BMS). Exercise Shakti is an ongoing series of joint exercises between the Indian and French armies begun in 2011. Exercise Shakti is conducted to practice and validate anti-terrorist operations and drills in snowbound and mountainous areas. Exercise Indra is a bi-annual military exercise conducted jointly by India and Russia, which began in 2003. Exercise Nomadic Elephant is a series of exercises held by the Indian Army with the Mongolian Army. The aim of the exercises is to enhance counter-insurgency and counter-terrorism operations, and to conduct peacekeeping operations under the mandate of the United Nation. Exercise Rudra Akrosh, in May 2012, was an exercise carried out by the Indian Army to test the preparedness level of its units, and to validate new age technology, battle concepts, organisational structures and networked operations. The Western Army Command conducted the exercise in Punjab, Jammu and Kashmir. Exercise Ashwamedha was a recent exercise to test the army's network-centric warfare capabilities. It was held in the Thar desert with over 300,000 troops participating. Asymmetric warfare capability was also tested by the Indian Army during the exercise. The Indian Navy is the naval branch of the Indian armed forces. With 58,350 men and women, including 7,000 personnel of the Indian Naval Air Arm, 1,200 Marine Commandos (MARCOS) and 1,000 personnel of the Sagar Prahari Bal. The Indian Navy is one of the world's largest naval forces and aspires to develop into a blue water navy. The Indian Navy has a large operational fleet consisting of 2 aircraft carriers, 1 amphibious transport dock, 9 Landing ship tanks, 10 destroyers, 14 frigates, 1 nuclear-powered attack submarine, 14 conventionally-powered attack submarines, 24 corvettes, 6 mine countermeasure vessels, 25 patrol vessels, 4 fleet tankers and various auxiliary vessels. The Indian navy operates one aircraft carrier, INS Vikramaditya, a modified Kiev-class ship. The navy also operates three Delhi-class and five Rajput-class guided-missile destroyers. The Delhi and Rajput-class destroyers will be replaced in the near future by the next-generation Kolkata class (Project 15A destroyers). In addition to destroyers, the navy operates several classes of frigates such as three Shivalik (Project 16 class) and six Talwar-class frigates. Seven additional Shivalik-class frigates (Project 17A-class frigates) are on order. The older Brahmaputra-class and Godavari-class frigates will be replaced systematically one by one as the new classes of frigates are brought into service over the next decade. Smaller littoral zone combatants in service are in the form of corvettes, of which, the Indian Navy operates the Kamorta, Kora, Khukri, Veer and Abhay classes. Replenishment tankers such as the Jyoti-class tanker, the Aditya class and the new Deepak-class fleet tankers help improve the navy's endurance at sea. These tankers will be the mainstay of the replenishment fleet until the first half of the 21st century. The Indian Navy operates a sizeable fleet of Sindhughosh (Russian Kilo-class design) and Shishumar (German Type 209/1500 design)-class submarines. A nuclear-powered attack submarine INS Chakra has been leased from Russia. India has started construction of six Scorpène-class submarines at Mazagon Dockyards Limited (MDL), in Mumbai under technology transfer from French firm DCNS. The new submarines will feature air-independent propulsion and are expected to start joining the navy during the second half of 2016. Designed for coastal defence against under-water threats, the 1,750-tonne submarine-submarine-killer (SSK) Scorpène is 67 metres (220 ft) in length and can dive to a depth of 300 metres (980 ft). According to French naval officials, the submarine can stay at sea for 45 days with a crew of 31. The standard version has six torpedo tubes and anti-shipping missile launchers. Another ambitious project in this regard is the nuclear-powered ballistic missile submarine manufacture programme – Arihant class. In the category of weapon systems, the Indian Navy operates K Missile family submarine launched ballistic missiles, the Prithvi-III ballistic ship-launched missile, and a number of land-attack cruise/Anti-ship missiles such as Brahmos Supersonic Cruise Missile, 3M-54E/3M-14E Klub Anti-Ship/Land Attack Cruise Missile (SS-N-27 Sizzler), Kh-35 (SS-N-25 SwitchBlade), P-20 (SS-N-2D Styx), Sea Eagle missile and Gabriel. Nirbhay long-range subsonic cruise missile and Brahmos Hypersonic Cruise Missile are in development. India has also fitted its P-8I Neptune reconnaissance aircraft with all-weather, active-rader-homing, over-the-horizon AGM-84L Harpoon Block II Missiles and Mk 54 All-Up-Round Lightweight Torpedoes. Indian warships' primary air-defence shield is provided by Barak-1 SAM, while an advanced version Barak-8, developed in collaboration with Israel, has entered service. India's next-generation Scorpène-class submarines will be armed with the Exocet anti-ship missile system. Among indigenous missiles, a ship-launched version of Prithvi-II is called the Dhanush, which has a range of 350 kilometres (220 mi) and can carry a nuclear warhead. The Indian Naval Air Arm is a branch of Indian Navy which is tasked to provide an aircraft carrier based strike capability, fleet air defence, maritime reconnaissance, and anti-submarine warfare. Flag Officer Naval Aviation (FONA) at Goa directs the field operations of the air arm. Naval Air Arm operates eight Tu-142 aircraft, which entered service in 1988. Upgrading of the aircraft is taking place, which helps to extend the service life of the aircraft by sixteen years. The BAE Sea Harrier operates from the INS Viraat. The BAE Sea Harrier FRS Mk.51 / T Mk.60 fly with the INAS 300 and INAS 552 squadrons of the Indian Navy. The Mikoyan MiG-29K will be deployed aboard INS Vikramaditya. The Indian Navy operates five Il-38 planes. They are being upgraded to use Sea Dragon suite. Used principally for anti-submarine warfare (ASW) and search and rescue roles, the helicopter fleet of Westland Sea King and the Sikorsky SH-3 Sea King operate from INS Garuda (Kochi) as well as INS Kunjali-II (Mumbai) air stations. 56 more naval utility helicopters are planned to be inducted from 2016. These will be used for surveillance, anti-submarine warfare, electronic intelligence gathering and search and rescue operations. The helicopters will be equipped with 70mm rocket launchers, 12.7 mm guns, lightweight torpedoes and depth charges. The Indian Navy will also continue to procure HAL Dhruv as a multi-role utility platform. In the long-range maritime reconnaissance (LRMR) role, the navy uses Boeing P-8I Neptune and has issued a global tender for nine medium-range maritime reconnaissance (MRMR) aircraft for coastal defence. India's first exclusive defence satellite GSAT-7 was successfully launched by European space consortium Arianespace's Ariane 5 rocket from Kourou spaceport in French Guiana in August 2013, giving a major push to the country's maritime security. The Indian Navy is the user of the multi-band, home-built communication spacecraft, which is operational. GSAT-7 was designed and developed by the Indian Space Research Organisation (ISRO) and is expected to operate for seven years in its orbital slot at 74 degrees east, providing UHF, S-band, C-band and Ku-band relay capacity. Its Ku-band capacity is expected to provide high-density data transmission facility both for voice and video. This satellite has been provided with additional power to communicate with smaller and mobile (not necessarily land-based) terminals. This dedicated satellite is expected to provide the Indian navy with an approximately 3,500–4,000 kilometres (2,200–2,500 mi) footprint over the Indian Ocean region, and over both the Arabian Sea and the Bay of Bengal region and enable real-time networking of all its operational assets in the water (and land). It also will help the navy to operate in a network-centric atmosphere. Ships from the Indian navy, Japan Maritime Self-Defense Force during exercise Malabar 2017. India often conducts naval exercises with other friendly countries designed to increase naval interoperability and also to strengthen cooperative security relationships. Some exercises take place annually like: the Varuna with the French Navy, Konkan with the Royal Navy, Indra with Russian Navy, Malabar with the US and Japan navies, Simbex with the Republic of Singapore Navy and IBSAMAR with the Brasil and South African navies. In 2007, Indian Navy conducted naval exercise with the Japan Maritime Self-Defence Force and the U.S Navy in the Pacific and also signed an agreement with Japan in October 2008 for joint naval patrolling in the Asia-Pacific region. India has also held naval exercise with Vietnam, the Philippines and New Zealand. In 2007, India and South Korea decided to conduct annual naval exercises and India participated in the South Korean international fleet review. In addition, the Indian Navy will also be increasing naval co-operation with other allies, particularly with Germany, and Arab states of the Persian Gulf including Kuwait, Oman, Bahrain and Saudi Arabia. Indian Navy also took part in the world's largest naval exercise/war-game RIMPAC 2014 along with 22 other nations and has since taken part in RIMPAC each year. INS Vikrant is the Indian Navy's first indigenous aircraft carrier, shown here in 2015. In recent years, the Indian Navy has undergone modernisation and expansion with the intention of countering growing Chinese maritime power in the Indian Ocean and reaching the status of a recognised blue-water navy. New equipment programmes include: the lease of a nuclear-powered submarine INS Chakra from Russia, the ex-Soviet carrier INS Vikramaditya and the first of the indigenously-built Arihant-class ballistic missile submarines by 2016, the first of the Scorpène-class submarines by 2016 and the indigenously-built aircraft carrier INS Vikrant by 2018. The plan in the near future is to have two aircraft carriers at sea at all times, with a third docked up in maintenance. Other programmes include the Talwar and Shivalik frigates and the Kolkata-class destroyers, all of which will be equipped with the BrahMos cruise missile. In a significant step towards India's pursuit for self-reliance in indigenous warship building, four anti-submarine Kamorta-class stealth corvettes with features such as an X Form Hull and inclined sides for low radar cross-section, infra-red suppression, and acoustic quieting systems are being built for the Indian Navy. Recent induction of the attack submarine INS Chakra, and the development of INS Arihant, make the Indian Navy one of six navies worldwide capable of building and operating nuclear-powered submarines. (Others include: China, France, Russia, the United Kingdom and the United States.) India also launched a 37,500-ton indigenous aircraft carrier INS Vikrant in August 2013 in its bid to join a select group of nations - the United States, the United Kingdom, Russia and France - capable of building such warships. It will undergo extensive tests in the next few years before it is commissioned into the navy. INS Vikrant, is expected to carry MiG 29K fighters and light combat aircraft such as the HAL Tejas. India is also set to become the first country to buy a military aircraft from Japan since World War II. India is expected to sign a deal for the purchase of six Utility Seaplane Mark 2 (US-2) amphibian aircraft when Prime Minister Narendra Modi visits Japan from 31 August – 3 September 2014. The 47-tonne US-2 aircraft does not require a long airstrip to take off or to land. It is capable of taking off from land and water (300 metres (330 yd)-stretch). It can carry loads of up to 18 tonnes and can be engaged in search and rescue operations. With a range of over 4,500 kilometres (2,800 mi) it can patrol areas 1,800 kilometres (1,100 mi) away and react to an emergency by landing 30 armed troops even in waves as high as 10 feet (3.0 m). Historically, the IAF has generally relied on Soviet, British, Israeli and French military craft and technology to support its growth. IAF's primary air superiority fighter with the additional capability to conduct air-ground (strike) missions is Sukhoi Su-30MKI. The IAF have placed an order for a total of 272 Su-30MKIs of which 205 are in service as of May 2015. The Mikoyan MiG-29 is a dedicated air superiority fighter, and constitutes a second line of defence after the Sukhoi Su-30MKI. At present, 66 MiG-29s are in service, all of which are being upgraded to the MiG-29UPG standard. The Dassault Mirage 2000 is the primary multirole fighter in service and the IAF operates 49 Mirage 2000Hs which are being upgraded to the Mirage 2000-5 MK2 standard. As part of the upgrade, the aircraft will also be equipped with MBDA's MICA family of medium-range missiles. To give the IAF fighters an edge in anti-ship and land attack roles, a smaller version of BrahMos missile is being developed to be integrated in Sukhoi Su-30MKI and is expected to be delivered to IAF by 2015. As an airborne early warning system, the IAF operates the Israeli EL/W-2090 Phalcon Airborne Early Warning and Control System AEW&C. A total of three such systems are in service, with possible orders for two more. The DRDO AEW&CS is a project of India's DRDO to develop an AEW&C system for the Indian Air Force. The DRDO AEWACS programme aims to deliver three radar-equipped surveillance aircraft to the Indian Air Force. The aircraft platform selected was the Embraer ERJ 145. Three ERJ 145 were procured from Embraer at a cost of US$300 Million, including the contracted modifications to the airframe. Probable delivery date for the first batch of three is 2015. The Indian Air Force (IAF) made progress towards becoming a truly network-centric air force with the integration of Air Force Network (AFNET), a reliable and robust digital information grid that enables accurate and faster response to enemy threats, in 2010. The modern, state-of-the-art AFNET is a fully secure communication network, providing IAF a critical link among its command and control centre, sensors such as the Airborne Early Warning and Control Systems, and attack platforms such as fighter aircraft and missile launchers. Integrated Air Command and Control System (IACCS), an automated command and control system for Air Defence (AD) operations will ride the AFNet backbone integrating all ground-based and airborne sensors, AD weapon systems and C2 nodes. In October 2013, IAF launched its own stand-alone ₹3 Billion ($34 Million USD) cellular network, through which secure video calling and other information exchange facilities will be provided. The IAF also plans to issue around one hundred thousand mobile handsets to its personnel of the rank of sergeant and above to connect and provide secure 'end-point' connectivity to airborne forces deployed across the country. The captive network has been named 'Air Force Cellular'. While Phase I of the project will ensure mobile connectivity to all air combat units in the National Capital Region, its Phase II will cover the rest of the bases. India has ordered 15 heavy-lift Chinook helicopters from the US. Photo shows a US Army Chinook. The Medium Multi-Role Combat Aircraft (MMRCA) competition, also known as the MRCA tender, was a competition to supply 126 multi-role combat aircraft to the Indian Air Force (IAF). The Defence Ministry has allocated ~ US$13 billion for the purchase of these aircraft, making it India's single largest defence deal. The MRCA tender was floated with the idea of filling the gap between its future Light Combat Aircraft and its in-service Sukhoi Su-30MKI air superiority fighter. On 31 January 2012, it was announced that Dassault Rafale won the competition due to its lower life-cycle cost. However the tender was cancelled in July 2015. The Indian Air Force (IAF) is also in the final stages of acquiring 22 Apache Longbow gunships, armed with Hellfire and Stinger missiles in a $1.2 billion contract and 15 heavy-lift Boeing CH Chinook helicopters. The IAF has initiated the process for acquisition of additional Mi-17 IV helicopters, heavy lift helicopters, Advanced Light Helicopter and Light Combat Helicopters. Among trainer aircraft, the Hawk Advanced Jet Trainer has been inducted and the Intermediate Jet Trainer (IJT) would be acquired in the near future. In recent times, India has also manufactured its own aircraft such as the HAL Tejas, a 4th generation fighter, and the HAL Dhruv, a multi-role helicopter, which has been exported to several countries, including Israel, Burma, Nepal and Ecuador. A weaponised version of Dhruv is called the HAL Rudra, which is armed with high-velocity M621 20 mm cannon, long-range 70 mm rockets (8 km), air-to-air missiles (Mistral-II), and MAWS (missile approach warning system). Combat in Kargil highlighted the requirement of an attack helicopter specially made for such high-altitude operations. The HAL Light Combat Helicopter (LCH) is a multi-role combat helicopter being developed in India by Hindustan Aeronautics Limited (HAL) for use by the Indian Air Force and the Indian Army. The LCH is being designed to fit into an anti-infantry and anti-armour role and will be able to operate at high altitudes. LCH will be fitted with indigenous anti-tank missile Helina. India also maintains unmanned aerial vehicle (UAV) squadrons (primarily Searcher-II and Heron from Israel) which can be used to carry out ground and aerial surveillance. India is also testing its own long-range Beyond Visual Range missile| (BVR) an air-to-air missile named Astra, and also building a Medium Altitude Long Endurance Unmanned Aerial Vehicle (UAV) called Rustom. India is also in an ambitious collaboration programme with Russia to build fifth-generation fighter aircraft, called HAL/Sukhoi FGFA which will be based on the Russian Sukhoi Su-57 fighter. Earlier in 2013, the two sides completed the preliminary design of the FGFA and are now negotiating a detailed design contract. Although there is no reliable information about the Su-57 and FGFA specifications yet, it is known from interviews with individuals in the Russian Air Force that it will be stealthy, have the ability to supercruise, be outfitted with the next generation of air-to-air, air-to-surface, and air-to-ship missiles, and incorporate an AESA radar. Joint co-development and co-production of Multi-role Transport Aircraft (MTA), by Russian partners and HAL, is being launched to meet the requirements of the Russian and Indian Air Forces. The aircraft will be designed for the roles of a 15–20 ton cargo / troop transport, paratrooping / airdrop of supplies including Low Altitude Parachute Extraction System (LAPES) capability. It will be configured such that all types of cargo can be transported, and the aircraft would be capable of operating from semi-prepared runways. The MTA is expected to replace the Indian Air Force's ageing fleet of Antonov An-32 transport aircraft. The aircraft is expected to conduct its first flight by 2017, and to enter service by 2018. To protect IAF assets on the ground, there has been a search for short-range surface-to-air missile. India has begun deploying six Akash surface-to-air missile (SAM) squadrons in the northeast to deter Chinese jets, helicopters and drones against any misadventure in the region. The IAF has started taking delivery of the six Akash missile squadrons, which can "neutralise" multiple targets at a 25 kilometres (16 mi) interception range in all weather conditions, earmarked for the eastern theatre. The IAF has already deployed the first two Akash squadrons at the Mirage-2000 base in Gwalior and the Sukhoi base in Pune. The Indian Coast Guard (ICG) is the fourth branch of Indian Armed Forces that protects India's maritime interests and enforces maritime law, with jurisdiction over the territorial waters of India, including its contiguous zone and exclusive economic zone. The Indian Coast Guard was formally established on 18 August 1978 by the Coast Guard Act, 1978 of the Parliament of India as an independent Armed force of India. It operates under the Ministry of Defence. The Coast Guard works in close cooperation with the Indian Navy, the Department of Fisheries, the Department of Revenue (Customs) and the Central and State police forces. The Assam Rifles trace their lineage to a paramilitary police force that was formed under the British in 1835 called Cachar Levy. Since then the Assam Rifles have undergone a number of name changes before the name Assam Rifles was finally adopted in 1917. Over the course of its history, the Assam Rifles, and its predecessor units, have served in a number of roles, conflicts and theatres including World War I where they served in Europe and the Middle East, and World War II where they served mainly in Burma. In the post-World War II period, the Assam Rifles have expanded greatly as has their role. There are currently 46 battalions of Assam Rifles under the control of the Indian Ministry of Home Affairs (MHA). They perform many roles including: the provision of internal security under the control of the army through the conduct of counter insurgency and border security operations, provision of aid to the civil power in times of emergency, and the provision of communications, medical assistance and education in remote areas. In times of war they can also be used as a combat force to secure rear areas if needed. The Special Frontier Force (SFF) is India's paramilitary unit. It was initially conceived in the post Sino-Indian war period as a guerrilla force composed mainly of Tibetan refugees whose main goal was to conduct covert operations behind Chinese lines in case of another war between the People's Republic of China and India. Later, its composition and roles were expanded. The following are the five police forces termed as Central Armed Police Forces according to the nomenclature adopted from the year 2011. The Special Protection Group (SPG) was formed in 1988 by an act of the Parliament of India to "provid[e] proximate security to the Prime Minister of India and former Prime Minister of India and members of their immediate families (wife, husband, children and parents)". For former Prime Ministers and their dependents, a regular review is held to decide whether the threat to their life is high enough to warrant SPG protection. The National Disaster Response Force (NDRF) is a specialised force constituted "for the purpose of specialist response to a threatening disaster situation or disaster". It is manned by persons on deputation from the various Central Armed Police Forces. At present it has 12 battalions, located in different parts of India. [needs update] The control of NDRF lies with the National Disaster Management Authority (NDMA), which is headed by the Prime Minister. Para (Special Forces): Formed in 1966, the Para (SF) are the largest and most important part of the Special Forces of India. They are a part of the highly trained Parachute Regiment of the Indian Army. The main aim of having a Parachute Regiment is for quick deployment of soldiers behind the enemy lines to attack the enemy from behind and destroy their first line of defence. Para (SF) conducted a series of joint exercises with US army special forces called Vajra Prahar. Ghatak Force:Ghatak Platoon, or Ghatak Commandos, is a special operations capable infantry platoon. There is one platoon in every infantry battalion in the Indian Army. Ghatak is a Hindi word meaning "killer" or "lethal". They act as shock troops and spearhead assaults ahead of the battalion. Their operational role is similar to Scout Sniper Platoon, STA platoon of the U.S. Marine Corp and the Patrols platoon of the British Army. A Ghatak Platoon is usually 20-men strong, consisting of a commanding captain, 2 non-commissioned officers and some special teams like marksman and spotter pairs, light machine gunners, a medic, and a radio operator. The remaining soldiers act as assault troopers. Most undergo training at the Commando Training Course in Belagavi, Karnataka. Often, other specialised training like heliborne assault, rock climbing, mountain warfare, demolitions, advanced weapons training, close quarter battle and infantry tactics are also given. Members of the platoon are also sent to the High Altitude Warfare School and Counterinsurgency and Jungle Warfare School. Marine Commandos (MARCOS): Marine Commandos (MARCOS) is an elite special operations unit of the Indian Navy. It is specially organised, trained and equipped for the conduct of special operations in a maritime environment. The force has gradually acquired experience and a reputation for professionalism over the two decades it has been in existence. Now it is one of the finest Special Forces units in the world and among the few units qualified to jump in the water with a full combat load. The MARCOS are capable of undertaking operations in all types of terrain, but are specialised in maritime operations in Jammu and Kashmir through the Jhelum River and Wular Lake. To strengthen its capabilities to carry out special operations, the navy is planning to procure advanced Integrated Combat System (ICS) for the MARCOS. The Navy wants the ICS for effective command, control and information sharing to maximise capabilities of individuals and groups of the MARCOS while engaging enemies. [needs update] The individual equipment required by the navy in the ICS includes light weight helmets, head-mounted displays, tactical and soft ballistic vests along with communication equipment. The group-level gear requirements include command and control and surveillance systems along with high speed communication equipment. Garud Commando Force: The Garud Commando Force is the Special Forces unit of the Indian Air Force. It was formed in September 2004 and has a strength of approximately 2000 personnel. [needs update] The unit derives its name from Garuda, a divine bird-like creature of Hindu Mythology. Garud is tasked with the protection of critical Air Force bases and installations; search and rescue during peace and hostilities and disaster relief during calamities. Garuds are deployed in the Congo as part of the UN peace keeping operations. In 1992 India signed the Chemical Weapons Convention (CWC), stating that it did not have chemical weapons or the capacity or capability to manufacture them. By so doing, India became one of the original signators of the Chemical Weapons Convention [CWC] in 1993, and ratified it on 2 September 1996. In June 1997, India declared its stock of chemical weapons (1,044 tonnes of sulphur mustard) had been destroyed. By the end of 2006, India had destroyed more than 75 percent of its chemical weapons/material stockpile and was granted an extension to destroying the remaining stocks by April 2009. It was expected to achieve 100 percent destruction within that time frame. India informed the United Nations in May 2009 that it had destroyed its stockpile of chemical weapons in compliance with the international Chemical Weapons Convention. With this India has become third country after South Korea and Albania to do so. This was cross-checked by United Nations' inspectors. India has also ratified the Biological Weapons Convention (January 1973) and pledges to abide by its obligations. There is no clear evidence, circumstantial or otherwise, that directly points toward an offensive biological weapons programme. India does possess the scientific capability and infrastructure to launch such an offensive programme, but has chosen not to do so. India has been in possession of nuclear weapons since 1974. Its most recent nuclear test took place on 11 May 1998, when Operation Shakti (Pokhran-II) was initiated with the detonation of one fusion and three fission bombs. On 13 May 1998, two additional fission devices were detonated. However, India maintains a "no-first use" and a nuclear deterrence policy against nuclear adversaries. Its nuclear doctrine envisages building a credible minimum deterrent for maintaining a "second strike capability" which would be massive and designed to induce unacceptable damage on the enemy. India is one of only four nations in the world to possess a Nuclear Triad. India's nuclear missiles include the Prithvi, the Agni the Shaurya, the Sagarika, the Dhanush, and others. India conducted its first test with the Agni-V in April 2012 and a second test in September 2013. With its 5,000 kilometres (3,100 mi) range, it can carry a nuclear warhead to the east to include all of China, and to the west deep into Europe. Agni-VI, with a perceived range of 6,000–8,000 kilometres (3,700–5,000 mi) is also under development with features like multiple independently targetable re-entry warheads (MIRVs). India also has bomber aircraft such as the Tupolev Tu-142 as well as fighter jets like the Sukhoi Su-30MKI, the Dassault Mirage 2000, the MiG-29 and the HAL Tejas capable of being armed with nuclear tipped bombs and missiles. Since India does not have a nuclear first use policy against an adversary, it becomes important to protect from a first strike. This protection is being developed in the form of the two layered Anti-ballistic missile defence system. The Indian Army's Agni II medium-range ballistic missile on parade. INS Rajput shown firing a BrahMos (missile). The BrahMos is a Mach 3 Supersonic Cruise Missile developed in collaboration with Russia. Its land attack and anti-ship variants are in service with the Indian Army and Indian Navy. Sub-Launched and Air Launched variants are under development or testing. The BrahMos II is a Mach 7 Hypersonic Cruise Missile being developed in collaboration with Russia. The Nirbhay is a Long Range Sub-Sonic Cruise Missile. This Missile has a range of over 1,000 kilometres (620 mi). The Nag is a third generation "Fire-and-forget" anti-tank missile developed in India. It is one of five missile systems developed by the Defence Research and Development Organisation (DRDO) under the Integrated Guided Missile Development Program (IGMDP). The Helena is a variant of the NAG Missile to be launched from a helicopter. It will be structurally different from the Nag. The Shaurya is a canister launched hypersonic surface-to-surface tactical missile with a range more than 750 kilometres (470 mi). It provides the potential to strike an adversary in the short-intermediate range. The Prahaar is a solid-fuelled surface-to-surface guided short-range tactical ballistic missile. The Astra is a "Beyond Visual Range Air-to-Air Missile" (BVRAAM) developed for the Indian Air Force. India has a declared nuclear no-first-use policy and is in the process of developing a nuclear doctrine based on "credible minimum deterrence". In August 1999, the Indian government released a draft of the doctrine which asserts that nuclear weapons are solely for deterrence and that India will pursue a policy of "retaliation only". The document also maintains that India "will not be the first to initiate a nuclear first strike, but will respond with punitive retaliation should deterrence fail". The fourth National Security Advisor of India Shivshankar Menon signalled a significant shift from "no first use" to "no first use against non-nuclear weapon states" in a speech on the occasion of the Golden Jubilee celebrations of the National Defence College in New Delhi on 21 October 2010, a doctrine Menon said reflected India's "strategic culture, with its emphasis on minimal deterrence". However, whether the policy shift actually took place or not is unclear. Some argued that this was not a substantive change but "an innocent typographical or lexical error in the text of the speech". India's current PM Modi has, in the run up to the recent general elections, reiterated commitment to no first use policy. In April 2013 Shyam Saran, convener of the National Security Advisory Board, affirmed that regardless of the size of a nuclear "attack against India," be it a miniaturised version or a "big" missile, India will "retaliate massively to inflict unacceptable damage". Here, the term "attack against India" means attack against the "Union of India" or "Indian forces anywhere". India's missile defence network has two principal components – the Air Defence Ground Environment System (ADGES) and the Base Air Defence Zones (BADZ). The ADGES network provides for wide area radar coverage and permits the detection and interception of most aerial incursions into Indian airspace. The BADZ system is far more concentrated with radars, interceptors, surface-to-air missiles (SAMs) and anti-aircraft artillery (AAA) units working together to provide an intense and highly effective defensive barrier to attacks on vital targets. Introduced in light of the ballistic missile threat from Pakistan, it is a double-tiered system consisting of two interceptor missiles, namely the Prithvi Air Defence (PAD) missile for high-altitude interception, and the Advanced Air Defence (AAD) Missile for lower altitude interception. The two-tiered shield should be able to intercept any incoming missile launched 5,000 kilometres (3,100 mi) away. PAD was tested in November 2006, followed by AAD in December 2007. With the test of the PAD missile, India became the fourth country to have successfully developed an anti-ballistic missile system, after the United States, Russia and Israel. On 6 March 2009, India again successfully tested its missile defence shield, during which an incoming "enemy" missile was intercepted at an altitude of 75 kilometres (47 mi). On 6 May 2012, it was announced that Phase-I is complete and can be deployed on short notice to protect Indian cities. New Delhi, the national capital, and Mumbai, have been selected for the ballistic missile defence shield. After successful implementation in Delhi and Mumbai, the system will be used to cover other major cities in the country. This shield can destroy incoming ballistic missiles launched from as far as 2,500 kilometres (1,600 mi) away. When the Phase II is completed and the PDV is developed, the two anti-ballistic missiles can intercept targets up to 5,000 kilometres (3,100 mi) both at exo and endo-atmospheric (inside the atmosphere) regions. The missiles will work in tandem to ensure a hit probability of 99.8 percent. This system can handle multiple targets simultaneously with multiple interceptors. India is reported to have procured a squadron of S-300V systems which are in use as an anti-tactical ballistic missile screen. Defending against an attack by a cruise missile on the other hand is similar to tackling low-flying manned aircraft and hence most methods of aircraft defence can be used for a cruise missile defence system. To ward off the threats of nuclear-tipped cruise missile attack India has a new missile defence programme which will be focused solely on intercepting cruise missiles. The technological breakthrough has been created with an AAD missile. DRDO Chief, Dr. V K Saraswat stated in an interview: "Our studies have indicated that this AAD will be able to handle a cruise missile intercept." Barak-8 is a long-range anti-air and anti-missile naval defence system being developed jointly by Israel Aerospace Industries (IAI) and the Defence Research and Development Organisation (DRDO) of India. The Indian Army is considering the induction of a variant of the Barak 8 missile to meet its requirement for a medium-range surface-to-air air defence missile. The naval version of this missile has the capability to intercept incoming enemy cruise missiles and combat jets targeting its warships at sea. It would also be inducted into the Indian Air Force, followed by the Army. Recently developed, India's Akash missile defence system also has the capability to "neutralise aerial targets like fighter jets, cruise missiles and air-to-surface missiles". Both the Barak-8 and the Akash missile defence systems can engage multiple targets simultaneously during saturation attacks. On 17 November 2010, in an interview Rafael's vice-president Mr. Lova Drori confirmed that the David's Sling system has been offered to the Indian Armed Forces. This system is further designed to distinguish between decoys and the actual warhead of a missile. In October 2018, India inked an agreement with Russia for US$5.43 billion to purchase five S-400 Triumf surface-to-air missile defence systems. Traditionally, the bulk of intelligence work in India has been carried out by the Research and Analysis Wing (R&AW) and the Intelligence Bureau (IB). The various services intelligence directorates namely the Directorate of Military Intelligence (DMI), the Directorate of Air Intelligence (DAI), Directorate of Naval Intelligence (DNI) and some other agencies are also involved but their activity is smaller by comparison. The R&AW and IB agencies are composed largely of civilians. Military personnel are often deputed to these agencies, but the letter of the law and concerns of deniability limit the use of serving military officers in some types of activity (especially collection and action). The creation of an intelligence agency co-ordinating the intelligence arms of the three military services had long been called for by senior Indian military officers. It was formally recommended by the Cabinet Group of Ministers, headed by the then Deputy Prime Minister of India Lal Krishna Advani. The Group of Ministers investigated intelligence lapses that occurred during the Kargil War and recommended a comprehensive reform of Indian intelligence agencies. The Defence Intelligence Agency was created and became operational in March 2002. As part of expanding bilateral co-operation on gathering intelligence and fighting terrorism, the United States military also provided advice to Indian military officers on the creation of the DIA. The DRDO's avionics programme has been a success story with its mission computers, radar warning receivers, high accuracy direction finding pods, synthetic aperture radar, Active Phased Array Radar, airborne jammers and flight instrumentation in use across a wide variety of Indian Air Force aircraft and satellites. DRDO labs have developed many electronic warfare systems for IAF and the Indian Army and high-performance Sonar systems for the navy. DRDO also developed other critical military hardware, such as the Arjun Main Battle Tank, and is engaged in the development of the future Infantry Combat Vehicle, the "Abhay". The DRDO is also a member of the trials teams for the T-72 upgrade and its fire control systems. INSAS, India's de facto standard small arms family including assault rifle, light machine guns and carbine, is developed at the Armament Research and Development Establishment, a DRDO laboratory. ARDE also worked on the development of Pinaka Multi Barrel Rocket Launcher, which has a maximum range of 39 kilometres (24 mi) - 40 kilometres (25 mi) and can fire a salvo of 12 high-explosive rockets in 44 seconds, neutralising a target area of 3.9 square km. This project was one of the first major Indian defence projects involving the Private sector. DRDO executed the Integrated Guided Missile Development Programme (IGMDP) to establish the ability to develop and design a missile locally, and manufacture a range of missile systems for the three defence services. The programme has seen significant success in its two most important constituents — the Agni missiles and the Prithvi missiles, while two other programmes, the Akash SAM and the anti-tank Nag Missile have seen significant orders. Another significant project of DRDO has been the Astra beyond-visual-range air-to-air missile (BVR), for equipping IAF's air-superiority fighters. The crown jewel of DRDO has been the BrahMos programme (as a joint venture with Russian NPO), which aims at creating a range of supersonic cruise missiles derived from the Yakhont system. The DRDO has been responsible for the navigational systems on the BrahMos, aspects of its propulsion, airframe and seeker, fire control systems, mobile command posts and the Transporter Erector Launcher. The DRDO has also developed many unmanned aerial vehicles- such as the Nishant tactical UAV and the Lakshya Pilotless Target Aircraft (PTA). The Lakshya PTA has been ordered by all three services for their gunnery target training requirements. Efforts are ongoing to develop the PTA further, with an improved all-digital flight control system, and a better turbojet engine. The DRDO is also going ahead with its plans to develop a new class of UAV, referred to by the HALE (High Altitude Long Endurance) and MALE (Medium Altitude Long Endurance) designations. The MALE UAV has been tentatively named the Rustom, and will feature canards and carry a range of payloads, including optronic, radar, laser designators and ESM. The UAV will have conventional landing and take off capability. The HALE UAV will have features such as SATCOM links, allowing it to be commanded beyond line of sight. Other tentative plans speak of converting the LCA into an unmanned combat aerial vehicle (UCAV), and weaponising UAVs such as AURA. In 2010, the defence ministry drafted a 15-year "Technology Perspective and Roadmap", which held development of ASAT weapons "for electronic or physical destruction of satellites in both LEO (2,000-km altitude above earth's surface) and the higher geosynchronous orbit" as a thrust area in its long-term integrated perspective plan under the management of DRDO. On 10 February 2010, Defence Research and Development Organisation Director-General, and Scientific Advisor to the Defence Minister, Dr VK Saraswat stated that India had "all the building blocks necessary" to integrate an anti-satellite weapon to neutralise hostile satellites in low earth and polar orbits. India is known to have been developing an exo-atmospheric kill vehicle that can be integrated with the missile to engage satellites. The Hypersonic Technology Demonstrator Vehilce (HSTDV) is an unmanned scramjet demonstration aircraft for hypersonic flight (Mach 6.5). The HSTDV program is run by the DRDO. India sought to augment its naval force in the Gulf of Aden by deploying the larger INS Mysore to patrol the area. Somalia also added India to its list of states, including the US and France, who are permitted to enter its territorial waters, extending up to 12 nautical miles (22 km; 14 mi) from the coastline, in an effort to check piracy. An Indian naval official confirmed receipt of a letter acceding to India's prerogative to check such piracy. "We had put up a request before the Somali government to play a greater role in suppressing piracy in the Gulf of Aden in view of the United Nations resolution. The TFG government gave its nod recently." In November 2008, an Indian navy warship destroyed a suspected Somali pirate vessel after it came under attack in the Gulf of Aden. In a report on Somalia submitted to the Security Council, UN Secretary General Ban Ki-Moon said "I welcome the decision of the governments of India and the Russian Federation to cooperate with the Transitional Federal Government of Somalia to fight piracy and armed robbery against ships." India also expressed the desire to deploy up to four more warships in the region. On 2010-09-06, a team of Indian marine commandos (MARCOS) boarded MV Jag Arnav and overpowered attacking pirates — seven heavily armed Somalis and one Yemeni national. In the seven year time frame India deployed 52 warships to combat piracy, which resulted in the area up to 65 degrees east being cleared of pirates. The Indian Air Force provides regular relief operation for food and medical facilities around the world using its cargo aircraft most notably the Ilyushin Il-76. The most recent relief operation of the IAF was in Kyrgyzstan. [needs update] During the 2010 Ladakh floods, two Ilyushin Il-76 and four Antonov-32 aircraft of the IAF carried 30 tonnes of load, which include 125 rescue and relief personnel, medicines, generators, tents, portable X-ray machines and emergency rescue kits. A MI-17 helicopter and Cheetah helicopter were used to increase the effectiveness of the rescue operations. During the 2013 Uttrakhand Floods, the Indian armed forces took part in rescue operations. By 21 June 2013, the Army had deployed 10,000 soldiers and 11 helicopters, the navy had sent 45 naval divers, and the Air force had deployed 43 aircraft including 36 helicopters. From 17 to 30 June 2013, the IAF airlifted a total of 18,424 people — flying a total of 2,137 sorties and dropping/landing a total of 3,36,930 kg of relief material and equipment. The IAF participated in the rescue operation codenamed Operation Raahat and evacuated more than 4640 Indian citizens (along with 960 foreign nationals from 41 countries) from Yemen during the 2015 military intervention by Saudi Arabia and its allies in that country during the Yemeni Crisis. The Indian Air Force successfully undertook sorties to help Indian scientists study the total solar eclipse that took place on 23 July 2010. Two separate missions from Agra and Gwalior were flown along the path of the moon's shadow, a mission that was deemed hugely successful by scientists associated with the experiment. While one AN-32 transport aircraft carrying scientific equipment, cameras and scientists took off from Agra and landed back after a three-hour flight, a Mirage-2000 trainer from Gwalior took images of the celestial spectacle from 40,000 feet (12,000 m). With weather being clear at such altitudes and coordinates planned by the IAF pilots, both the AN-32 and Mirage-2000 pilots were able to accomplish the mission successfully. The Indian Navy regularly conducts adventure expeditions. The sailing ship and training vessel INS Tarangini began circumnavigating the world on 23 January 2003, intending to foster good relations with other nations; she returned to India in May of the following year after visiting 36 ports in 18 nations. Lt. Cdr. M.S. Kohli led the Indian Navy's first successful expedition to Mount Everest in 1965. Another Navy team also successfully scaled Everest from the north face, the more technically challenging route. 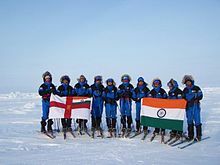 An Indian Navy team comprising 11 members successfully completed an expedition to the North Pole in 2006. The Indian Naval ensign first flew in Antarctica in 1981. The Indian Navy succeeded in Mission Dakshin Dhruv by traversing to the South Pole on skis in 2006. With this historic expedition, they set the record for being the world's first military team to have successfully completed a ski traverse to the geographic south pole. There are number of uniform forces in India apart from the Indian Armed Forces. All such forces are established under the acts of Parliament. They are: the Central Reserve Police Force, the Border Security Force, the Indo-Tibetan Border Police, the Central Industrial Security Force, the Sashastra Seema Bal, the Assam Rifles, the National Security Guard under the Ministry of Home Affairs (India), the Special Protection Group under the Cabinet Secretariat of India, the Railway Protection Force under Ministry of Railways (India) and the Indian Coast Guard under the Ministry of Defence (India). These forces are referred to as "Armed Force of the Union" in their respective acts, which means a force with armed capability and not necessarily "Armed Forces" - the term as per international standards and conventionally referred to as Army, Navy and Air Force. The Supreme Court in its judgements reported in AIR 1996 SC 1705 held that the military service is only confined to three principal wings of the armed forces i.e. Army, Navy and Air Force. Further the Honourable Supreme Court of India in a case reported in AIR 2000 SC 3948 clarified that unless it is a service in the three principal wing of the Armed Forces, a force included in the expression "Armed forces of the Union" does not constitute part of the military service/military. To differentiate from Armed Forces, Some of other forces were commonly referred to as Central Paramilitary Forces which caused confusion and give the impression of them being part of the military forces. To remove such confusion, in 2011 the Ministry of Home Affairs adopted the uniform nomenclature of Central Armed Police Forces for only five of its Primary Police organisations. These were formerly called as Paramilitary Forces. Central Armed Police Forces are still incorrectly referred to as "Paramilitary Forces" in the media and in some correspondences. These forces are headed by officers from the Indian Police Service and are under the Ministry of Home Affairs. The Indian Coast Guard is often confused incorrectly as being a part of the military forces due to the organisation being under the Ministry of Defence. The Supreme Court in its judgement has held that unless it is a service in the three principal wings of the Armed Forces, a force included in the expression "Armed forces of the Union" does not constitute part of military service/military. The Indian Coast Guard works closely with civilian agencies such as Customs, the Department of Fisheries, the Coastal Police etc. with its primary role being that of a non-military, maritime law enforcement agency. It is independent of the command and control of the Indian Navy. ICG was initially planned to be kept under the Ministry of Home Affairs but has been kept under the Ministry of Defence for better synergy since it is patterned like the navy. The ICG does not take part in any protocol of military forces such as the President's Body Guard, ADCs, the Tri-Services Guard of Honour etc. Their recruitment is also not underthe Combined Defence Services Exam/National Defence Academy Exam which is one of the prime modes of commissioning officers to the Armed Forces. Indian Coast Guard Officers continue to get their training with Indian Navy Officers since the ICG does not have its own training academy. Already a new Indian Coast Guard Academy for training of their officers is under construction. [needs update] Often ICG loses its credit for being incorrectly recognised as part of Indian military Forces and not as a unique independent force. ^ "Finance Minister Arun Jaitley has to do balancing act with defence". Archived from the original on 24 September 2015. ^ "Jaitley gets charge of Defence Ministry after Parrikar resignsa". Deccan Herald. Archived from the original on 13 March 2017. ^ "Navy chief Sunil Lanba takes over as chairman, Chiefs of Staff committee". 29 December 2016. Archived from the original on 2 January 2017. ^ "Categories of Entry". Indian Army. Archived from the original on 23 August 2011. Retrieved 23 August 2011. ^ "20% Sailor Shortage in Navy, 15% Officer Posts Vacant In Army, Nirmala Sitharaman Tells Parliament". ^ a b c d "India / Aircraft / Jianjiji / Fighter". Stockholm International Peace Research Institute. Archived from the original on 19 January 2012. ^ "Czech Tatra becoming into Indian Armed Forces". MAFRA a.s. Archived from the original on 10 January 2015. Retrieved 19 February 2015. ^ a b "Arms Transfers Database". SIPRI. Archived from the original on 14 February 2013. Retrieved 20 February 2013. ^ "Indian Armed Forces". Know India Portal. NIC, GoI. Archived from the original on 25 September 2015. Retrieved 17 September 2015. ^ "CIC Order" (PDF). Right to Information. CIC, GoI. Archived from the original (PDF) on 25 September 2015. Retrieved 17 September 2015. ^ Matters, Professional (12 July 2011). "Report My Signal- Professional Matters: The Central Police Forces and State Armed Police". Reportmysignalpm.blogspot.com. Archived from the original on 30 March 2012. Retrieved 17 August 2012. ^ a b "Press Information Bureau". Archived from the original on 15 September 2016. Retrieved 15 September 2016. ^ a b "20% Sailor Shortage in Navy, 15% Officer Posts Vacant In Army, Nirmala Sitharaman Tells Parliament". News18. Retrieved 2017-12-28. ^ John Pike. "India - Army". Archived from the original on 6 January 2016. ^ a b c "Now, India has a nuclear triad". The Hindu. Archived from the original on 24 September 2015. Retrieved 17 October 2016. ^ a b "Breaking News, World News & Multimedia". Archived from the original on 8 January 2014. ^ Rabinowitz, Gavin (18 June 2008). "India's army seeks military space program". The San Francisco Chronicle. Archived from the original on 21 March 2012. ^ "End of an era: Israel replaces Russia as India's top military supplier". World Tribune. Archived from the original on 13 August 2011. Retrieved 18 March 2011. ^ "Russia Competing to Remain India's Top Military Supplier". India Defence. Archived from the original on 18 August 2017. Retrieved 18 March 2011. ^ Cohen, Stephen and Sunil Dasgupta. "Arms Sales for India". Brookings Institution. Archived from the original on 9 March 2011. Retrieved 18 March 2011. ^ "BBC News - SOUTH ASIA - Indian seabed hides ancient remains". bbc.co.uk. Archived from the original on 30 April 2008. ^ "DKPA : Stamp Calendar - Stamps Issued by India in February 2001". geocities.com. Archived from the original on 27 October 2009. ^ Indian Army List for October 1939. Government of India Press. 1939. ^ a b The Navy List for August 1939. HM Stationery Office. 1939. pp. 620–621. ^ The Air Force List for August 1939. HM Stationery Office. 1939. pp. 870–871. ^ a b "Colonies, Colonials and World War Two". Archived from the original on 2 July 2012. Retrieved 30 September 2013. ^ The Air Force List: June 1940. HM Stationery Office. 1940. p. 702. ^ Indian Army List for July 1942. Government of India Press. 1942. p. 1933. ^ "Officers For India: Beginning of Big Changes". The Times. 30 May 1945. ^ "The Indian Forces: Gradual Elimination of European Officers". The Times. 23 October 1945. ^ "British Troops In India: Reported Plans For Withdrawal". The Times. 17 June 1947. ^ "Nationalization of Indian Army". The Times. 27 October 1948. ^ "New Designs of Crests and Badges in the Services" (PDF). Press Information Bureau of India - Archive. Archived (PDF) from the original on 8 August 2017. ^ Wirsing, Robert (1991-11-15). Pakistan's security under Zia, 1977–1988: the policy imperatives of a peripheral Asian state. Palgrave Macmillan, 1991. ISBN 9780312060671. ^ Child, Greg (1998). Thin air: encounters in the Himalayas. The Mountaineers Books, 1998. ISBN 9780898865882. ^ Kapur, S. Paul (2007). Dangerous Deterrent: Nuclear Weapons Proliferation and Conflict in South Asia. Stanford University Press. p. 118. ISBN 978-0804755504. ^ "Military to expand strategic footprint Rejig to guard India interests". telegraphindia.com. Archived from the original on 7 October 2011. ^ "About - The President of India". Archived from the original on 5 April 2016. Retrieved 8 March 2016. ^ "Site Under Construction". Archived from the original on 24 September 2015. ^ "The Indian Air Force Today". Archived from the original on 21 September 2013. Retrieved 2 October 2013. ^ a b "Know your own strength". The Economist. Archived from the original on 2 April 2013. ^ "Redoctrinisation of the Indian Armed Forces". Slideshare.net. Archived from the original on 28 November 2009. Retrieved 1 August 2010. ^ "Book on Customs & Etiquettes in the Services Released". Press Information Bureau, Government of India. 3 September 2007. Archived from the original on 17 January 2016. Retrieved 10 March 2011. ^ "About Us". Indian Military Review. Archived from the original on 13 July 2011. Retrieved 10 March 2011. ^ "Press Information Bureau". pib.nic.in. Archived from the original on 12 May 2013. ^ India-Brasil-South Africa ‘Tango’ at Sea | Institute for Defence Studies and Analyses Archived 21 July 2011 at the Wayback Machine. Idsa.in (16 May 2008). Retrieved 6 January 2012. ^ India to take part in China's International Fleet Review Archived 16 November 2010 at the Wayback Machine. The Hindu. (20 March 2009). Retrieved 6 January 2012. ^ "Aspects of India's Economy Remembering Socialist China, 1949-1976". rupe-india.org. Archived from the original on 24 September 2015. ^ "Indian Expenditure Budget Vol. I, 2015–2016" (PDF). Archived (PDF) from the original on 18 March 2015. ^ PTI (29 February 2016). "Union Budget 2016-17: MHA gets Rs77,383.12 crore, a 24.56% hike". Archived from the original on 19 July 2016. ^ Cohen, Stephen P. and Sunil Dasgupta, "The Drag on India's Military Growth" Archived 23 December 2010 at the Wayback Machine, The Brookings Institution Archived 10 February 2006 at the Wayback Machine, September 2010. ^ a b "India's military weakness". Archived from the original on 14 June 2013. ^ "India's navy in .8bn sub deal". BBC News. 12 September 2005. Archived from the original on 27 January 2011. Retrieved 5 May 2010. ^ Shalini Singh (22 August 2009). "Govt plans Rs 10,000cr dedicated telecom network for armed forces — India — The Times of India". The Times of India. Retrieved 1 August 2010. ^ "Resettlement and welfare of ex-servicemen" (PDF). Archived from the original (PDF) on 22 March 2012. ^ "Indian Army's shameful treatment of women recruits". NDTV. Archived from the original on 10 March 2016. ^ a b c d e f g h i j k (Iiss), The International Institute of Strategic Studies (2017-02-14). The Military Balance 2017. Routledge, Chapman & Hall, Incorporated. ISBN 9781857439007. ^ "Gaya Officers Training Academy poised to conduct maiden passing out parade". Yahoo News. 6 June 2012. Archived from the original on 4 February 2013. Retrieved 10 July 2012. ^ "Making the water boil in Afghanistan". Archived from the original on 19 December 2013. Retrieved 30 September 2013. ^ "India Reportedly Basing Helicopters, Fighter Jets In Tajikistan". Archived from the original on 2 October 2013. Retrieved 30 September 2013. ^ "India air base grounded in Tajikistan". Archived from the original on 24 September 2015. Retrieved 30 September 2013. ^ "India to provide choppers to Tajikistan". Archived from the original on 3 October 2013. Retrieved 30 September 2013. ^ "Indo-Israel Military Cooperation". idsa-india.org. Archived from the original on 1 July 2015. ^ "The Tribune, Chandigarh, India - Editorial". tribuneindia.com. Archived from the original on 20 April 2017. ^ "India - Nepal". countrystudies.us. Archived from the original on 30 December 2016. ^ "Indo-Bhutanese relations". loc.gov. Archived from the original on 24 September 2015. ^ "India bringing Maldives into its security net". Indianexpress.com. 13 August 2009. Archived from the original on 15 October 2009. Retrieved 1 August 2010. ^ "India, Japan in security pact; a new architecture for Asia?". Reuters. 25 October 2008. Archived from the original on 1 March 2010. ^ Ashok Sharma (17 June 2015). "What's behind the new US-India Defense Pact?". The Conversation. Archived from the original on 19 June 2015. ^ "INDIA-MYANMAR/TIES India to sign pact to develop Myanmar port". Aseanaffairs.com. Archived from the original on 7 July 2011. Retrieved 1 August 2010. ^ Nistula Hebbar. "India and UAE announce strategic partnership, front against terrorism". The Hindu. Archived from the original on 17 January 2016. ^ "Front Page: Navy foils bid to hijack Indian ship in Gulf of Aden". The Hindu. 12 November 2008. Archived from the original on 20 October 2010. Retrieved 1 August 2010. ^ "India's Growing Military Diplomacy". Archived from the original on 27 August 2013. Retrieved 30 September 2013. ^ "India, Singapore sign fresh pact on Army training". Archived from the original on 12 October 2013. Retrieved 30 September 2013. ^ "Cold Start Doctrine". Archived from the original on 4 October 2013. Retrieved 1 October 2013. ^ "Indian Army raising new special forces battalion". Archived from the original on 5 October 2013. Retrieved 1 October 2013. ^ "Indian Army and Navy Seek Permission to Set Up Marine Brigade". Archived from the original on 4 October 2013. Retrieved 1 October 2013. ^ "Army chief reviews mountain strike corps". Times of India. Archived from the original on 3 September 2014. Retrieved 24 August 2014. ^ Walter C. Ladwig III Ladwig Iii, Walter C (2015). "Indian Military Modernization and Conventional Deterrence in South Asia". Journal of Strategic Studies. 38 (5): 729–772. doi:10.1080/01402390.2015.1014473. ^ Dunnigan, James. "India Joins The M-777 Club". Archived from the original on 5 October 2013. Retrieved 2 October 2013. ^ "Pinaka rocket system wins DRDO award". Sakaal Times. 22 April 2013. Archived from the original on 4 October 2013. Retrieved 24 July 2013. ^ "Union Government cleared 1500 crore Rupees Proposal for Pinaka Rockets". Jagran Josh. 25 March 2013. Archived from the original on 8 August 2013. Retrieved 24 July 2013. ^ Katoch, Prakash. "Modernisation of the Indian Infantry". Indian Defense Review. Archived from the original on 5 October 2013. Retrieved 3 October 2013. ^ "Army kicks off high-tech 'digital soldier' project". Business Standard. Archived from the original on 11 November 2013. Retrieved 12 November 2013. ^ "Indian Army to Break up Future Soldier Program into Two Parts". defenseworld.net. Archived from the original on 12 February 2017. ^ Kulkarni, Prasad (30 October 2009). "Special force to get training at INS Shivaji –". Times Of India. Retrieved 18 June 2012. ^ Pubby, Manu (1 March 2009). "Govt orders coastal security restructuring". The Indian Express. Retrieved 18 June 2012. ^ Scott, Dr. David (Winter 2007–2008). "India's drive for a 'blue water' navy" (PDF). Journal of Military and Strategic Studies. 10 (2). Archived from the original (PDF) on 28 May 2008. ^ Walter C. Ladwig III "Drivers of Indian Naval Expansion" (PDF). The Rise of the Indian Navy: Internal Vulnerabilities, External Challenges. Ashgate. 2015. Archived from the original (PDF) on 12 February 2016. ^ "First Scorpene submarine would be ready by 2014: French envoy". Archived from the original on 24 September 2015. Retrieved 1 October 2013. ^ "Indian Navy Requests New Patrol Aircraft". Archived from the original on 2 October 2013. Retrieved 30 September 2013. ^ "Barak Gets Bigger And Better". Archived from the original on 11 September 2013. Retrieved 30 September 2013. ^ Mallikarjun, Y. "Nuclear-capable Dhanush successfully test-fired". Archived from the original on 5 October 2013. Retrieved 3 October 2013. ^ "Navy to buy 56 utility helicopters for $1bn". Archived from the original on 24 September 2015. ^ "India Issues Global Tender for Maritime Recon Planes". Archived from the original on 22 February 2014. Retrieved 1 October 2013. ^ Lele, Ajey. "GSAT-7: India's Strategic Satellite". Archived from the original on 1 October 2013. Retrieved 2 October 2013. ^ "'Naseem Al Bahr', a Naval Exercise between Indian & Oman Navy Held". Archived from the original on 5 October 2013. Retrieved 2 October 2013. ^ "India and Saudi Arabia to Conduct Joint Naval and Military Exercises and Help Eliminate Piracy". Archived from the original on 25 May 2012. Retrieved 2 October 2013. ^ Gupta, Shishir. "India to play sea war games with 22 nations". Archived from the original on 10 October 2013. Retrieved 3 October 2013. ^ "Carrier battle groups will add muscle to Navy power". The Times of India. Archived from the original on 24 September 2015. ^ "Navy Chief Assures Sea Trials of Homegrown Nuclear Submarine INS Arihant Soon". Archived from the original on 2 October 2013. Retrieved 16 September 2013. ^ "First time since WW-II, India to buy amphibious aircraft from Japan". DNA India. Archived from the original on 25 August 2014. Retrieved 25 August 2014. ^ "India's Fighter Upgrades: Mirage 2000s Finally Get a Deal". Archived from the original on 5 October 2013. Retrieved 2 October 2013. ^ "Smaller version of BrahMos missile being developed for IAF". Archived from the original on 3 October 2013. Retrieved 30 September 2013. ^ "Air Force to receive BrahMos by 2015". Business Standard. Archived from the original on 26 November 2013. Retrieved 22 November 2013. ^ PTI. "IAF looking to induct seven more C-17 aircraft:NAK Browne". Archived from the original on 24 September 2015. Retrieved 2 October 2013. ^ "DRDO AWACS first batch delivery by 2015". Archived from the original on 4 October 2013. Retrieved 3 October 2013. ^ "IAF launches own 3G cellular network". Business Standard. Archived from the original on 29 October 2013. Retrieved 25 October 2013. ^ a b "Here is why Apache and Chinook helicopters are game changers for India". Archived from the original on 24 September 2015. ^ "theindependent.in : Modi's Make in India eats into Nation's Defense Capabilities". theindependent.in. ^ "ALH Rudra ready to spit fire". Archived from the original on 4 October 2013. Retrieved 1 October 2013. ^ "domain-b.com : Paris Air Show: First flight of HAL's light combat helicopter in 2008". domain-b.com. Archived from the original on 20 January 2015. ^ "Israel sells heron UAVs to India and Australia". Archived from the original on 29 September 2013. Retrieved 1 October 2013. ^ "National : Astra missile test-fired". The Hindu. 8 May 2009. Archived from the original on 15 June 2009. Retrieved 1 August 2010. ^ "Augmenting Capabilities" (PDF). Archived from the original (PDF) on 2 January 2010. Retrieved 25 August 2009. ^ "India to customise Russia's FGFA planes". Archived from the original on 3 October 2013. Retrieved 1 October 2013. ^ "Russian-Indian Military Transport JV Debuts at Aero India". Archived from the original on 4 October 2013. Retrieved 1 October 2013. ^ "With eye on China, India deploys Akash missiles in northeast". Times of India. Archived from the original on 24 August 2014. Retrieved 24 August 2014. ^ "Welcome chushigangdruk.org - Hostmonster.com". chushigangdruk.org. Archived from the original on 17 January 2016. ^ "Bollywood Sargam – Special: Tibetan faujis in Bluestar". bollywoodsargam.com. Archived from the original on 2 May 2013. ^ "Office Memorandum" (PDF). mha.nic.in. MHA, GoI. Archived from the original (PDF) on 17 January 2016. Retrieved 26 August 2015. ^ "Office Memorandum 1" (PDF). mha.nic.in. MHA, GoI. Archived from the original (PDF) on 17 January 2016. Retrieved 31 August 2015. ^ "For the paramilitary, all's in a new name". The Telegraph. The Telegraph Calcutta. Archived from the original on 24 September 2015. ^ GreaterKashmir.com (Greater Service) (2011-04-18). "CRPF ALL SET FOR IMAGE MAKEOVER". Greaterkashmir.com. Archived from the original on 6 January 2014. Retrieved 2014-01-05. ^ "CRPF to induct 38 new battalions in the coming years". Zeenews.com. Archived from the original on 20 December 2009. Retrieved 26 February 2014. ^ "CRPF to raise 37 new battalions by 2018". Indian Express. 13 March 2010. Archived from the original on 30 January 2011. Retrieved 26 February 2014. ^ "COBRA to sting Naxal virus: new force gets Centre nod". Financial Express. 29 August 2008. Archived from the original on 6 January 2014. Retrieved 26 February 2014. ^ IBTL (1 December 2012). "Border Security Force ( BSF ) – Duty unto Death | Dec 1, 1965 Foundation Day — IBTL". Ibtl.in. Archived from the original on 6 January 2014. Retrieved 5 January 2014. ^ "First ever women BSF to guard the Indian borders". Ibnlive.in.com. 18 July 2009. Archived from the original on 2 January 2014. Retrieved 26 February 2014. ^ "::Welcome to". Newsbharati.com. 23 February 2013. Archived from the original on 6 January 2014. Retrieved 5 January 2014. ^ "Indo-Tibetan Border Police". Archive.india.gov.in. Archived from the original on 12 November 2013. Retrieved 9 February 2014. ^ "ITBP to have 90,000-strong force by 2015". Hindustan Times. 2012-10-26. Archived from the original on 11 January 2014. Retrieved 2014-01-05. ^ "ITBP to get 15 new battalions". Indian Express. 24 October 2009. Archived from the original on 15 January 2011. Retrieved 5 January 2014. ^ "Guarding the Nation's Frontiers | eGov Magazine". Egov.eletsonline.com. 6 March 2013. Archived from the original on 6 January 2014. Retrieved 5 January 2014. ^ "About CISF". Cisf.nic.in. Archived from the original on 9 February 2014. Retrieved 2014-02-09. ^ "Govt to recruit 20,000 women in paramilitary forces in 3 years". NDTV.com. 12 May 2011. Archived from the original on 6 January 2014. Retrieved 5 January 2014. ^ Praveen Swami (21 July 2011). "The Indian fine art of faking security". The Hindu. Archived from the original on 6 January 2014. Retrieved 5 January 2014. ^ "RPF may find getting 4,000 women recruits tough". The Times of India. Archived from the original on 17 January 2016. ^ "Indian Commandos Set Free". Archived from the original on 29 October 2013. Retrieved 18 September 2013. ^ "Global Security aeticle — Parachute Regiment of India". Archived from the original on 22 February 2014. Retrieved 18 September 2013. ^ "Indian Army pulls in 'Ghatak Commandos' near LOC". Archived from the original on 18 September 2013. Retrieved 18 September 2013. ^ "INS Abhimanyu". Archived from the original on 24 October 2013. Retrieved 18 September 2013. ^ "CROCODILES OF WULLAR". Archived from the original on 8 October 2013. Retrieved 18 September 2013. ^ "Who are MARCOS". Archived from the original on 3 March 2014. Retrieved 18 September 2013. ^ "NTI-India-Chemical". nti.org. Nuclear Threat Initiative. Archived from the original on 8 June 2017. Retrieved 25 June 2017. ^ Kanwal, Gurmeet. "India's Nuclear Doctrine and Policy". Archived from the original on 4 October 2013. Retrieved 1 October 2013. ^ "None can intercept Agni-V: Chander". Archived from the original on 4 October 2013. Retrieved 18 September 2013. ^ "Advanced Agni-6 missile with multiple warheads likely by 2017". Archived from the original on 4 October 2013. Retrieved 1 October 2013. ^ Subramanian, T.S. "Agni-VI all set to take shape". Archived from the original on 4 October 2013. Retrieved 1 October 2013. ^ "India Aircraft Special Weapons Delivery Systems". Fas.org. Archived from the original on 4 September 2010. Retrieved 1 August 2010. ^ Press Trust of India (25 March 2014). "India test fires long range N-missile launched from under sea". business-standard.com. Archived from the original on 24 September 2015. ^ "Nirbhay to be test-fired in February". The Times of India. 19 January 2013. Archived from the original on 24 September 2015. Retrieved 19 January 2013. ^ "The Telegraph - Calcutta : Nation". telegraphindia.com. Archived from the original on 24 September 2015. ^ Journal of Electronic Defense Staff (2004). "Guided Threat Systems". International Electronic Countermeasures Handbook. Artech House. p. 115. ISBN 978-1-58053-898-5. ^ "DRDL: Areas of Work". Archived from the original on 10 February 2012. Retrieved 31 May 2012. ^ "Shourya/Sagarika Missile" (PDF). Archived (PDF) from the original on 17 August 2016. Retrieved 5 August 2016. ^ "India successfully test fires 'Shaurya' missile". expressindia.com. 12 November 2008. Archived from the original on 16 September 2012. ^ "News Archives: The Hindu". hindu.com. Archived from the original on 13 November 2013. ^ Y. Mallikarjun (3 July 2011). "India all set to test new short-range tactical missile". The Hindu. India. Archived from the original on 12 November 2011. Retrieved 20 October 2011. ^ "Astra BVRAAM more complex than Agni missiles". Domain-B. Balasore. 31 August 1998. Archived from the original on 12 June 2015. Retrieved 31 May 2012. ^ a b "Draft Report of National Security Advisory Board on Indian Nuclear Doctrine". Indianembassy.org. Archived from the original on 5 December 2009. Retrieved 30 April 2013. ^ "Speech by NSA Shri Shivshankar Menon at NDC on "The Role of Force in Strategic Affairs"". mea.gov.in. Archived from the original on 24 September 2015. ^ "Did India Change its Nuclear Doctrine? : Much Ado about Nothing". idsa.in. Archived from the original on 18 June 2015. ^ "Modi says committed to no first use of nuclear weapons". Reuters India. Archived from the original on 28 April 2015. ^ Bagchi, Indrani. "Even a midget nuke strike will lead to massive retaliation, India warns Pak – The Economic Times". The Economic Times. Retrieved 30 April 2013. ^ "India's Response to CBW attack". idsa.in. Archived from the original on 8 May 2015. ^ "Ballistic Missile Defence for India". Bharat Rakshak. Archived from the original on 2 August 2012. Retrieved 22 August 2012. ^ Pollack, Andrew. "India expects to use missile interception system as a weapon, top scientist says". International Herald Tribune. Archived from the original on 11 March 2009. Retrieved 19 April 2013. ^ "India developing new missiles Towards destroying hostile missiles". Hindu.com. 3 December 2006. Archived from the original on 29 June 2013. Retrieved 19 April 2013. ^ "India tests interceptor missile". 6 March 2009. Archived from the original on 2 June 2013. Retrieved 19 April 2013. ^ "Development of Ballistic Missile Defence System: Year End Review" (Press release). Ministry of Defence (India). 28 December 2007. Archived from the original on 5 January 2008. Retrieved 26 January 2008. ^ Pollack, Andrew. "India successfully tests missile interceptor". International Herald Tribune. Archived from the original on 10 March 2009. Retrieved 19 April 2013. ^ Rajat Pandit (26 November 2007). "India on way to joining exclusive BMD club". Timesofindia.indiatimes.com. Archived from the original on 13 May 2013. Retrieved 19 April 2013. ^ PTI (6 May 2012). "Missile defence shield ready: DRDO chief". Thehindu.com. Archived from the original on 14 January 2013. Retrieved 19 April 2013. ^ "Delhi, Mumbai selected for ballistic missile defence shield". The Times Of India. 24 June 2012. Archived from the original on 24 June 2012. ^ "Delhi, Mumbai to get missile defence shield – NDTV News". Ndtv.com. 24 June 2012. Archived from the original on 12 April 2013. Retrieved 19 April 2013. ^ "More Teeth to Defence System". IBNLive. Archived from the original on 24 September 2015. Retrieved 27 July 2012. ^ PTI (24 June 2012). "Delhi, Mumbai to be first provided with missile defence shield". Economictimes.indiatimes.com. Archived from the original on 19 May 2014. Retrieved 19 April 2013. ^ John Pike. "Ashwin Advanced Air Defence (AAD)". globalsecurity.org. Archived from the original on 3 May 2015. ^ "Strategic Air Defences in a Nuclear South-Asia". Bharat-Rakshak. 2 July 2009. Archived from the original on 4 August 2012. Retrieved 22 August 2012. ^ "India To Boost Airfield Defenses". DefenceNews. Archived from the original on 24 September 2015. Retrieved 22 August 2012. ^ a b c "India discovers methods to face missile wars". IBNLive. 16 December 2007. Archived from the original on 24 September 2015. Retrieved 8 August 2012. ^ "February trial for naval air defence missile". Indo-Asian News service. 16 November 2011. Archived from the original on 14 June 2015. Retrieved 8 August 2012. ^ Special Correspondent. "LRSAM flight tested successfully in Israel". The Hindu. Archived from the original on 26 November 2014. ^ "India Successfully Test Fires Medium-Range Akash Missile". NDTV.com. 19 June 2014. Archived from the original on 12 August 2016. ^ "Rafael Confirms Offer of Iron Dome, David's Sling to Indian Armed Forces". India-defence.com. Archived from the original on 14 May 2013. Retrieved 19 April 2013. ^ "India Russia S-400 missile deal: All you need to know - Times of India ►". The Times of India. Retrieved 2018-10-09. ^ "Ministry of Defence, Govt. of India". National Informatics Centre. Archived from the original on 13 July 2009. Retrieved 14 July 2009. ^ a b c d "Defence Intelligence Agency (DIA)". Global Security.org. Archived from the original on 23 July 2009. Retrieved 14 July 2009. ^ a b c "Defense Intelligence Agency to Start in February 2002". Federation of American Scientists. 30 January 2002. Archived from the original on 26 March 2009. Retrieved 14 July 2009. ^ "..:: India Strategic ::.. Indian Defence News: India's Defence Budget 2011-12". indiastrategic.in. Archived from the original on 7 July 2015. ^ Shukla, Ajai. "US offers to co-develop new Javelin missile with India". Business Standard. Archived from the original on 5 October 2013. Retrieved 3 October 2013. ^ "India to develop unmanned combat aerial vehicle". Archived from the original on 10 October 2013. Retrieved 2 October 2013. ^ "India developing unmanned combat aerial vehicle". Archived from the original on 4 October 2013. Retrieved 2 October 2013. ^ Rajat Pandit (25 May 2010). "India to gear up for 'star wars' – India — The Times of India". Timesofindia.indiatimes.com. Archived from the original on 27 May 2010. Retrieved 31 August 2010. ^ T. S. Subramanian (9 May 2008). "DRDO developing hypersonic missile". The Hindu. Chennai, India. Archived from the original on 9 March 2012. Retrieved 11 March 2012. ^ a b Tuteja, Ashok. "India largest contributor to UN peace missions". Archived from the original on 5 October 2013. Retrieved 2 October 2013. ^ "Ranking of Military and Police Contributions to UN Operations" (PDF). Archived (PDF) from the original on 3 March 2016. ^ "Indian Navy Destroyer In Anti-Piracy Action On Sept 5". Pakistan Defence. Archived from the original on 22 February 2011. ^ "India gets the right of hot pursuit in Somali waters". Ibnlive.in.com. Archived from the original on 16 December 2008. Retrieved 27 March 2009. ^ "Somalia seeks India's help to quell piracy- Politics/Nation-News-The Economic Times". Economictimes.indiatimes.com. 21 November 2008. Archived from the original on 16 December 2008. Retrieved 27 March 2009. ^ "Reuters.com". Africa.reuters.com. 9 February 2009. Archived from the original on 16 December 2008. Retrieved 27 March 2009. ^ Gibbons, Timothy J. (28 January 2009). "Navy helicopter squadron helps fight pirates". The Florida Times-Union. Archived from the original on 31 January 2009. Retrieved 28 January 2009. ^ "After 7 Years and Deployment of 52 Warships, This Area is Now Pirate-Free". Archived from the original on 11 August 2016. ^ "Indian aid flown to Kyrgyzstan". Sify.com. 6 July 2010. Archived from the original on 9 July 2010. Retrieved 1 August 2010. ^ "India sends aid to Kyrgyzstan". Hindustan Times. 1 July 2010. Archived from the original on 11 July 2010. Retrieved 1 August 2010. ^ "80 foreigners rescued from Leh: IAF". Archived from the original on 27 January 2014. Retrieved 17 September 2013. ^ "India appreciates Pakistan's gesture of evacuating its nationals from Yemen". The Times of India. 8 April 2015. Archived from the original on 12 April 2015. Retrieved 8 April 2015. ^ "Yemen crisis: Number of Indian evacuees reach 4000 mark". Zee News. 7 April 2015. Archived from the original on 13 April 2015. Retrieved 7 April 2015. ^ "4,000 Indians rescued so far, Yemen air evacuation op to end on Wed". hindustantimes.com. 7 April 2015. Archived from the original on 7 April 2015. Retrieved 7 April 2015. ^ "India evacuates 232 foreigners including Americans, Europeans from Yemen". The Times of India. 7 April 2015. Archived from the original on 7 April 2015. Retrieved 7 April 2015. ^ "PIB Press Release". Pib.nic.in. Archived from the original on 11 February 2010. Retrieved 1 August 2010. ^ "Indian Navy on top of the world". Archived from the original on 11 June 2008. Retrieved 2 October 2013. ^ "Chilling Out!". Archived from the original on 29 October 2010. Retrieved 2 October 2013. ^ "Navy team becomes first military unit to ski to South Pole". Archived from the original on 11 June 2008. Retrieved 2 October 2013. ^ "Office Memorandum" (PDF). MHA. MHA, GoI. Archived from the original (PDF) on 17 January 2016. Retrieved 26 August 2015. ^ "For the paramilitary, all's in a new name". The Telegrpah. The Telegraph Calcutta. Archived from the original on 24 September 2015. ^ "Mission". Indian Coast Guard. Archived from the original on 27 August 2015. Retrieved 26 August 2015. ^ "Detailed History of Indian Coast Guard [ In Detail ]". Indian Coast Guard. ICG. Archived from the original on 28 September 2015. Retrieved 17 September 2015. ^ "ICG More History". ICG. Indian Coast Guard. Archived from the original on 28 September 2015. Retrieved 26 August 2015.
International Institute for Strategic Studies (3 February 2010). Hackett, James, ed. The Military Balance 2010. London: Routledge. ISBN 978-1-85743-557-3.
International Institute for Strategic Studies (7 March 2012). Hackett, James, ed. The Military Balance 2012. London: Routledge. ISBN 978-1857436426.